Alexandre, the son, spent summers at Rochefort-sur-Nenon with his grandparents before following in his father’s footsteps and enrolling in the école hôtelière in neighbouring Le Touquet. ‘I grew up in a restaurant; c’est tout naturellement que j’ai suivi le chemin de mon pére. I was not done for studies. La cuisine, it was practical and exciting.’ Upon completion, the young Gauthier carried out a couple of stages in nearby Arras, at la Faisanderie, and at London’s Buckingham Hotel ahead of starting at the Hôtel Westminster back in Le Toquet under William Elliot – thereby beginning both a career that would take him around France and a relationship that endures today. 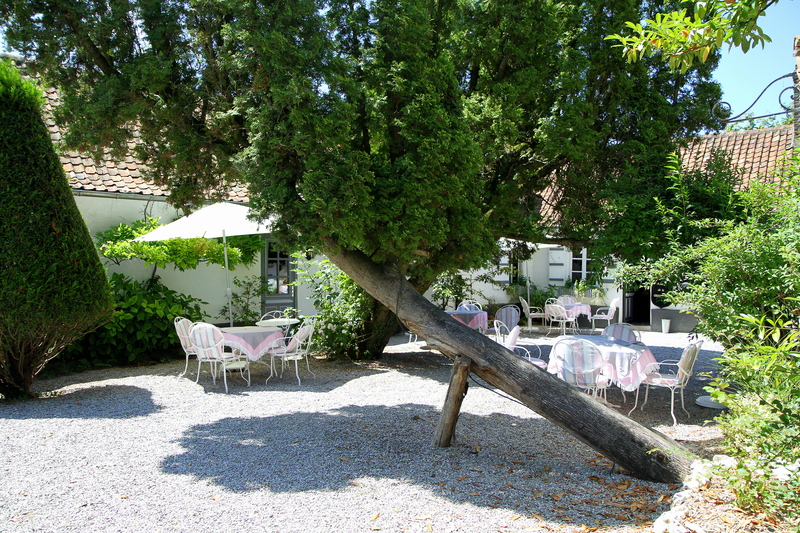 Next he headed to the Auberge et Clos des Cimes to work with Régis Marcon prior to moving further south to Olivier Brulard’s Résidence de la Pinède in Saint Tropez and, afterwards, west to La Rochelle and Restaurant Coutanceau « les Flots ». Then, at nineteen he relocated to Paris and Lasserre with Michel Roth. This domestic tour was also interspersed with international stages at Beijing’s Péninsula Palace, Hôtel du Lac (St Moritz) and the Institut culinaire in Palermo. 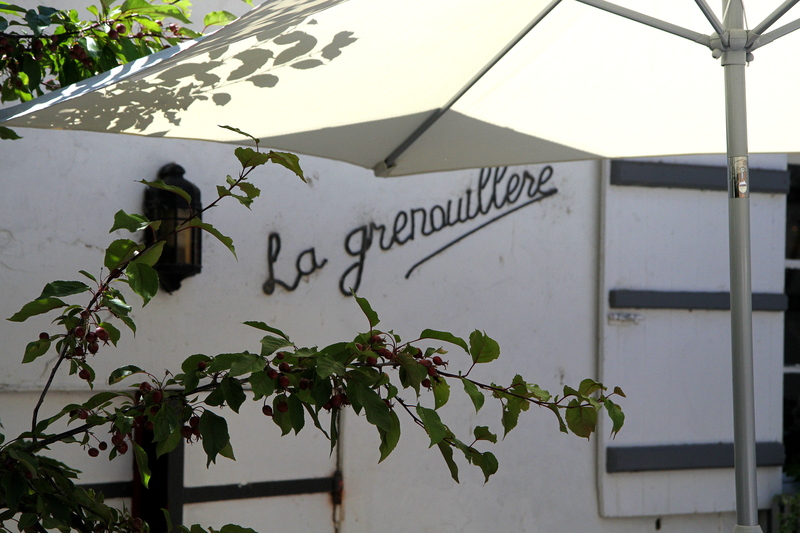 Back home, on the other hand, hard times had befallen his father, culminating in 2001 with the loss of the Michelin star that la Grenouillère had held since 1936. Thus, in 2003, at Roland’s request, the son returned. 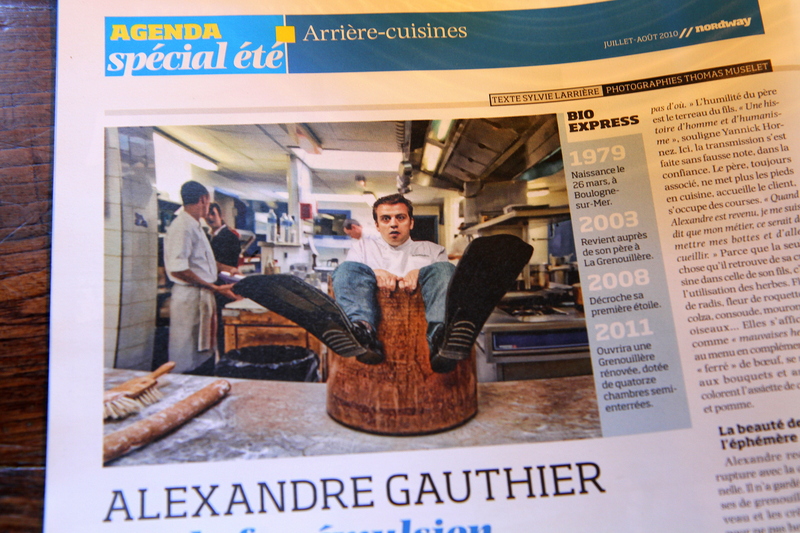 Alexandre immediately set about resurrecting the family’s restaurant – a regional institution. Even though he was only twenty-four, Roland took a back seat and allowed him to work as he wished. It was a great opportunity for the young man – ‘it’s huge what happened to me,’ – as well as a real challenge. But challenge was something this chef thrived on: the child, once an able scout, had grown into an avid adventure-sportsman – scuba-diving, rugby and mountain-climbing being some of his pursuits. Recognition came rapidly. 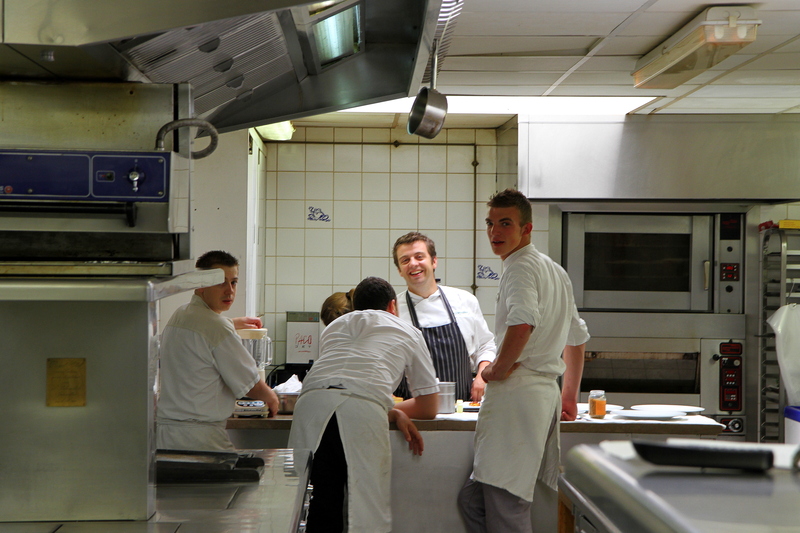 In 2005, Alain Ducasse invited him to Plaza Athénée to cook at Fou de France – an event showcasing promising French talent. That same year Gauthier also achieved a life long ambition by scaling Mount Kilimanjaro. 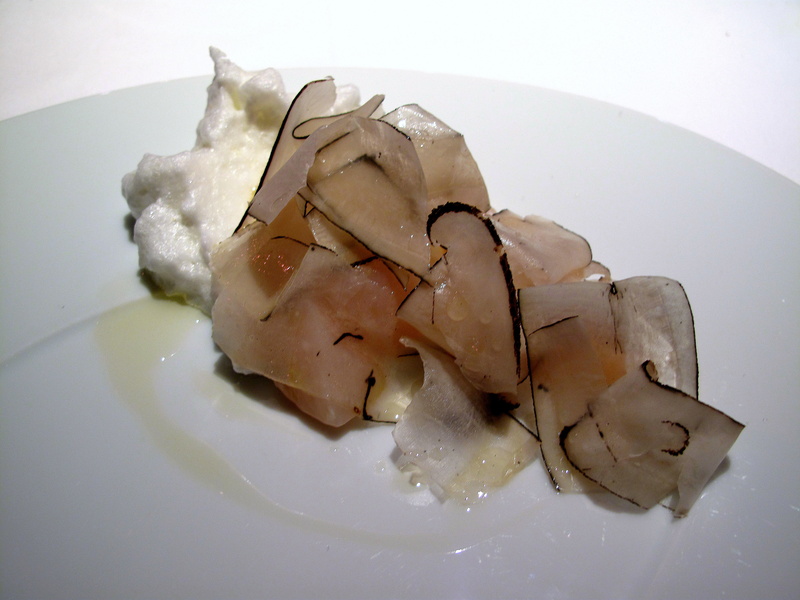 Subsequently, infamous French food critic François Simon singled him out as special amongst Génération C chefs (a movement embracing world flavours) whilst even Gordon Ramsay garnered him with praise. Most recently, the chef has become a favourite of Omnivore too – a fixture at OFF, he took part in both 2009’s ‘four f****** dinners’ and 2010’s ‘four friendly dinners’ in New York City as well, cooking at Momofuku Ssam Bar and then Roberta’s. He also now owns a casual eatery, Froggy’s Tavern in Montreuil, with William Elliot. 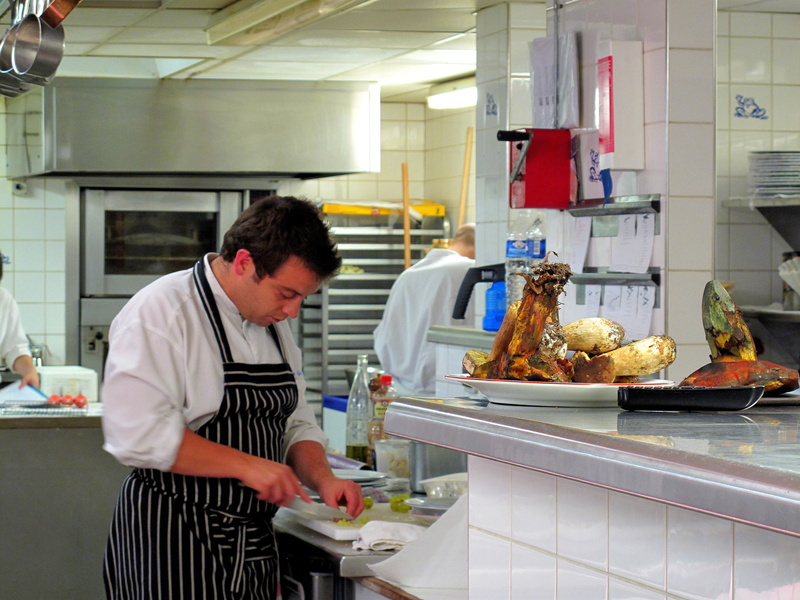 Despite being asked to run a restaurant at such a relatively early age, he has no regrets. Nearly. 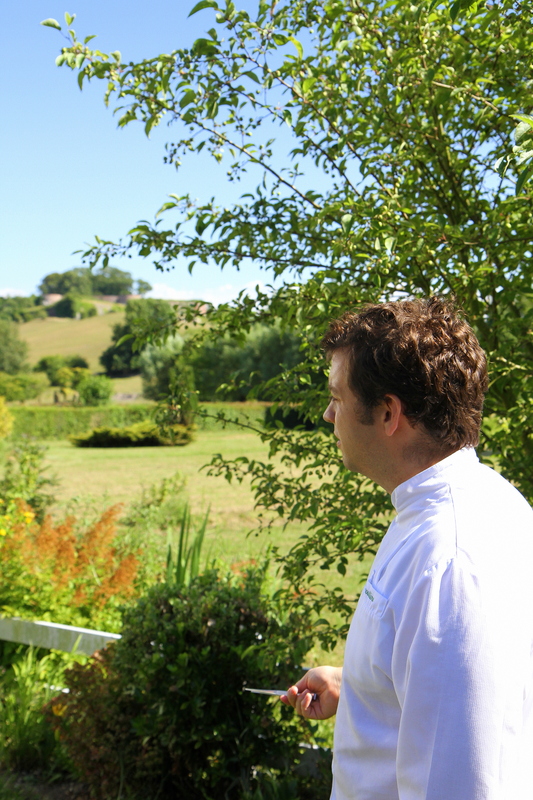 ‘I just wish I had time to work with Gagnaire, a brilliant madman, and Michel Bras, for the purity of his cuisine and incredible technique.’ He has succeeded regardless and in 2008, he regained la Grenouillère’s missing star, puting Montreuil back on the map gastronomique. Amidst the listless landscape that comprises Calais’ hinterland, Montreuil-sur-Mer lies upon the banks of the quiet Canche. Even if ironically most famous for what was in fact a fictional role in Les Misérables, it is also an ancient settlement that boasts fortifications constructed by Vauban. 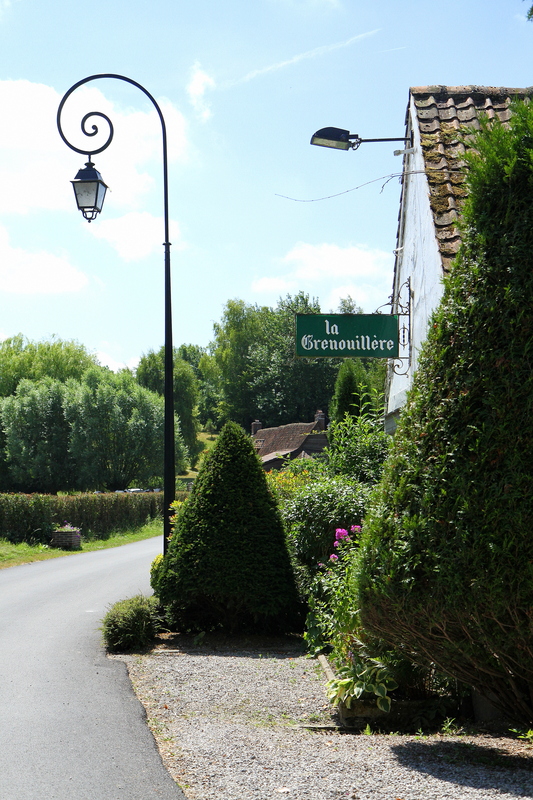 On the bounds of this town, balancing on the brim of one of the river’s easy meanders, the restaurant resides in a typical Picardy farmhouse. Dating from the nineteen-twenties, the main structure is nearly hidden behind low-sweeping trees and large shrubs that although appear as if allowed to grow capriciously about the building, are actually carefully kept. A tall, conspicuous conifer, leaning at a seemingly unfeasible angle, bows across a small, gravel courtyard littered with white, wrought-iron garden furniture. 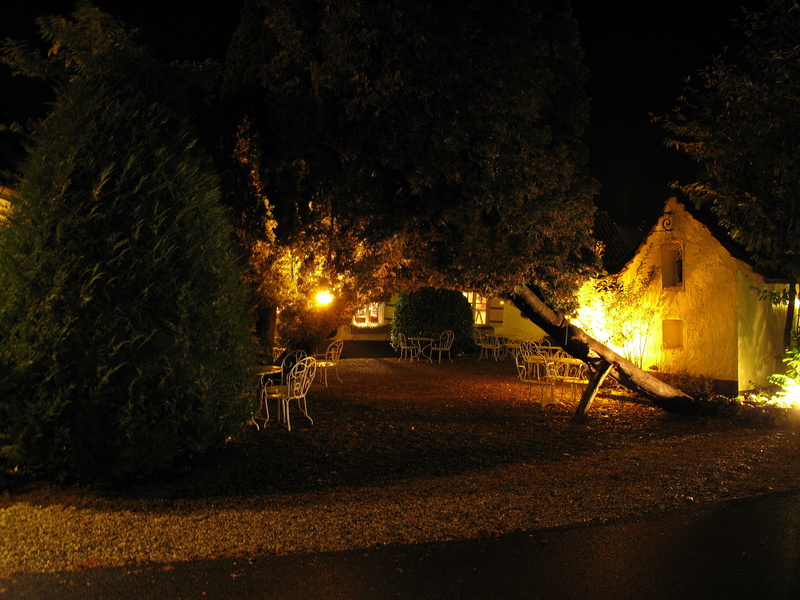 The entrance can be found on the far side of this terrace whilst guestrooms rest to its right. 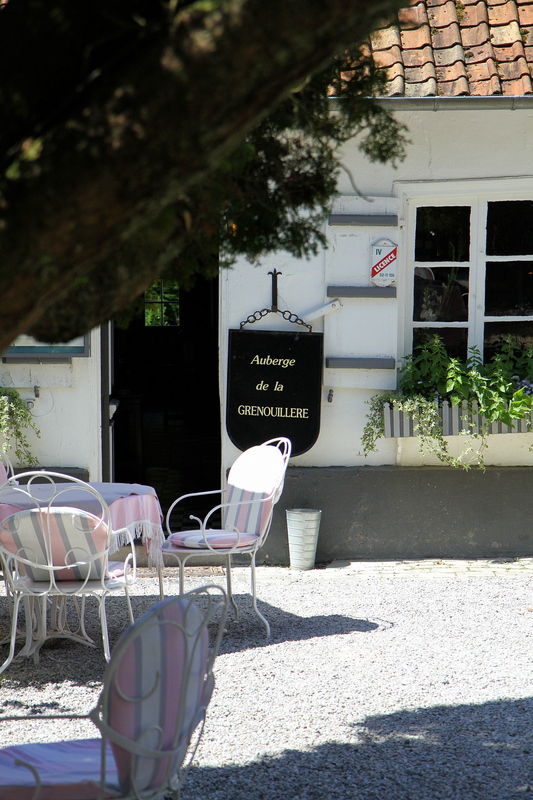 Carved into the stucco, ivory façade, itself interrupted only by latticed, shuttered windows and crowned with light brown, thatch roof, it is a small, unassuming doorway singled out only by a suspended, heraldic shield that spells the auberge’s appellation. Once within, the guest is immediately greeted by a little foyer that feels as if it could even perhaps pre-date the building. 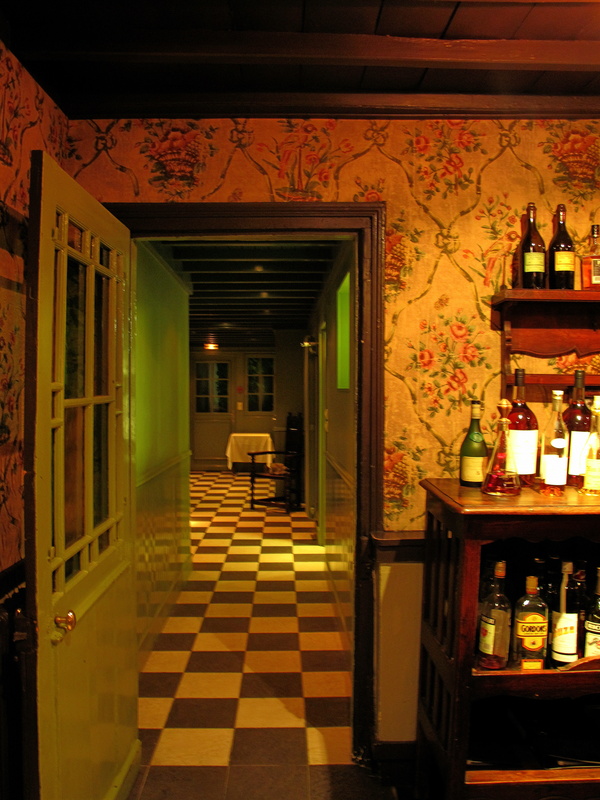 Along the back wall, several shelves lined with liquor bottles hang behind a large bar sculpted from deep, red wood. An iron fireplace stands to one side whilst buffets, the other. 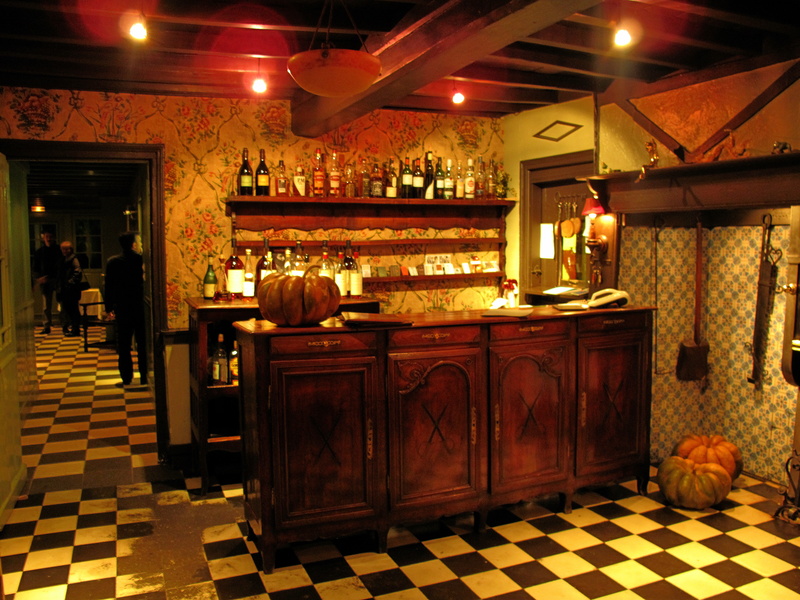 The floor is closely checked, black and white tile; large wooden braces criss-cross the ceiling; whilst the wallpaper is pale peachy-orange and decidedly floral. 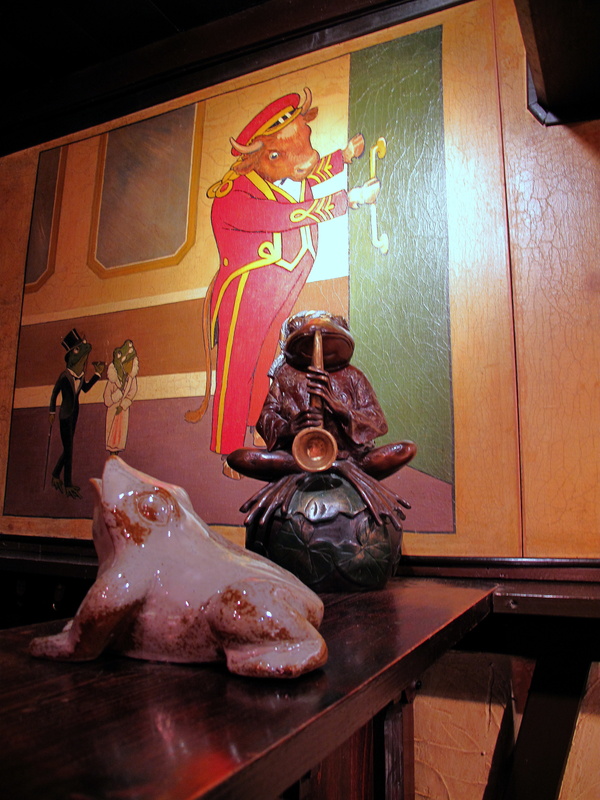 Trinkets are strewn over all the surfaces with frog figures featuring foremost. To the left and right of this space are two rooms holding fifty-five covers whilst the drawing room and kitchen are straight ahead. 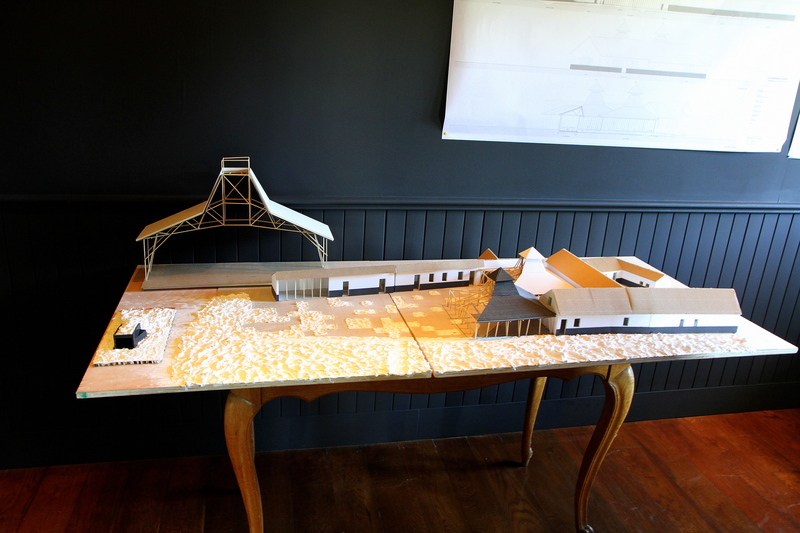 However, it should be noted that things are likely to change a little in early 2011 with the redesign of the kitchen, hotel and grounds by architect Patrick Bouchain. 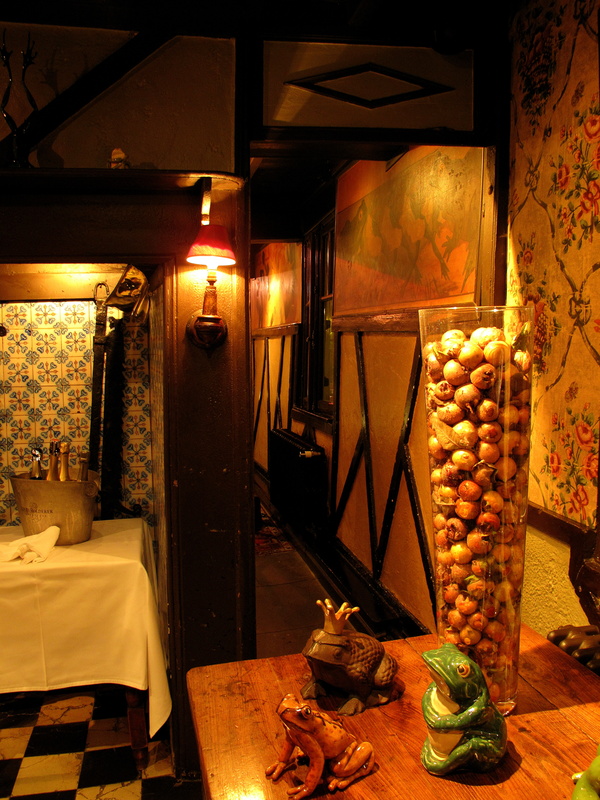 The main dining area is decorated in the same warm shades outlined with dark wood that forms the windowsills, faux half-timbering along the walls and beams above; several carpets are ornately red and deep blue. 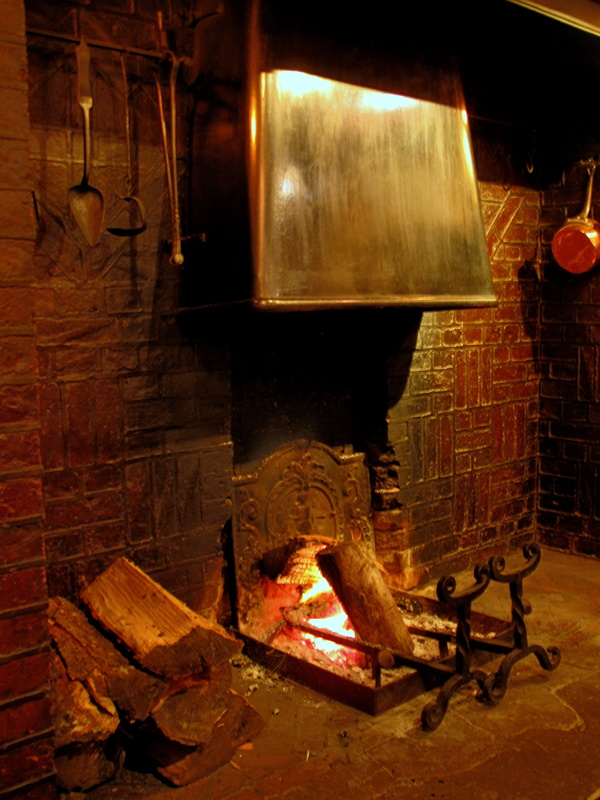 An antique brick fireplace complete with pendent copper pans and fresh logs sits betwixt the entry and kitchen door; atop it, inscribed upon a broad panel, is ‘la Légende de la Grenouillère’. 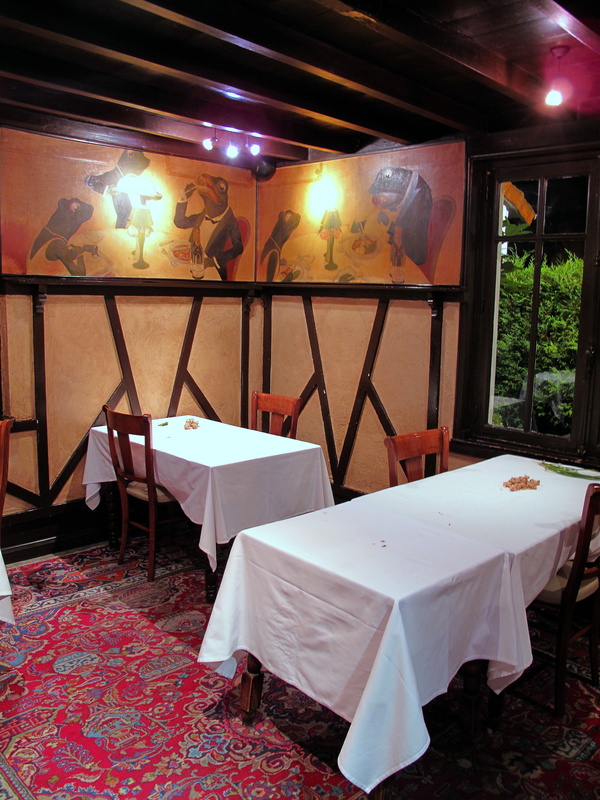 Girdling the whole room there is also a ring of hand-painted frescoes, drawn by American humorist Frank Reynolds in the thirties and depicting merry scenes of frogs eating and drinking at dinner tables as well as illustrations from such famous fables as those of la Fontaine. 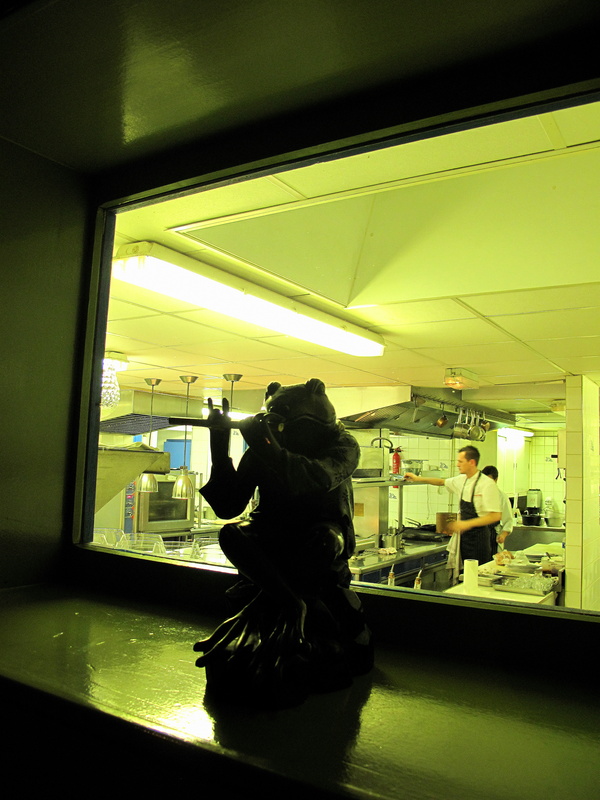 Together with the considerable number of frogish figurines, these make certain the restaurant lives up to its name. 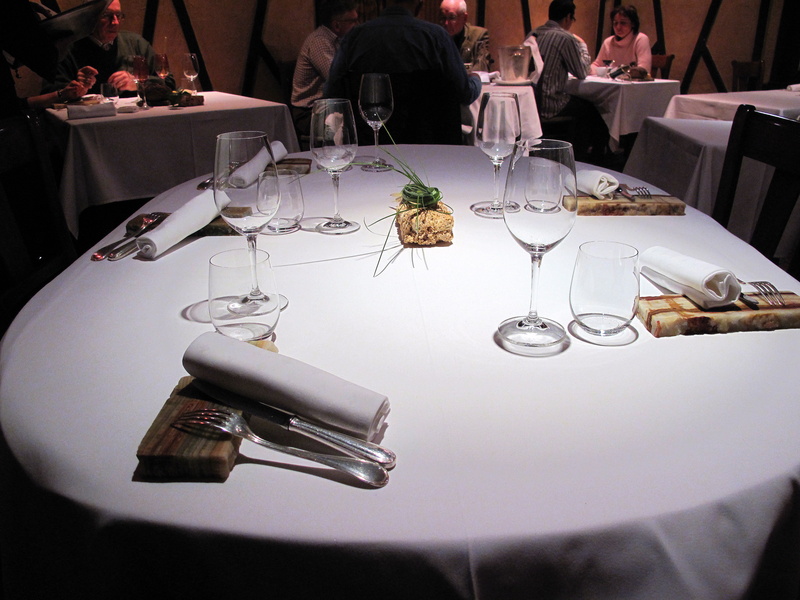 Tables are comfortably spaced and draped with immaculate linens. 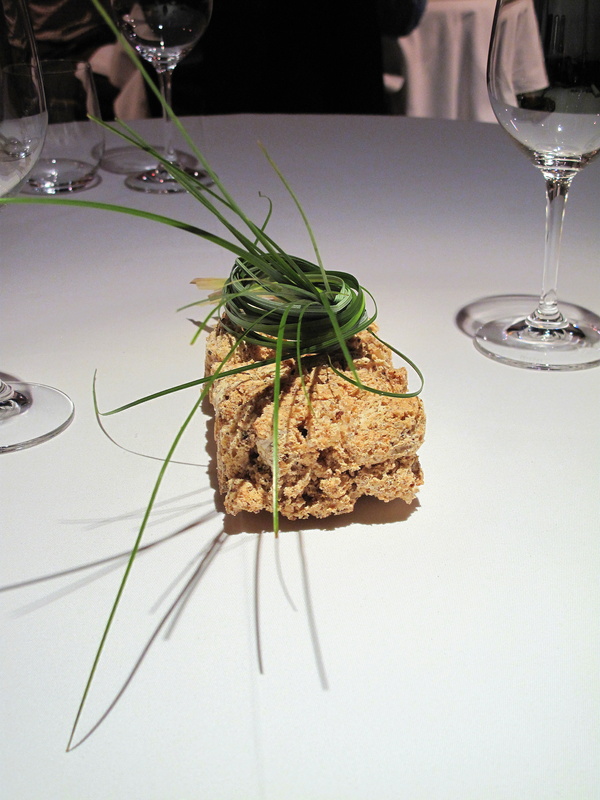 A small sedimentary tablet acts as both cutlery prop and bread plate whilst the only added adornment is a porous stone ingrained with twirled strands of wild grass. Amuse Bouche 1: Riz frites, sauce . Two tumblers came crammed with stubby chips inlaid in some hollandaise sauce spiked with ginger. These golden, glistening twigs were not actually fashioned from potato though, but from fried glutinous rice, thus they had a very interesting waxy texture as well as toothsome savour – underlined maybe with a little cheese. The vibrant emulsion was light yet velvety and vivid. 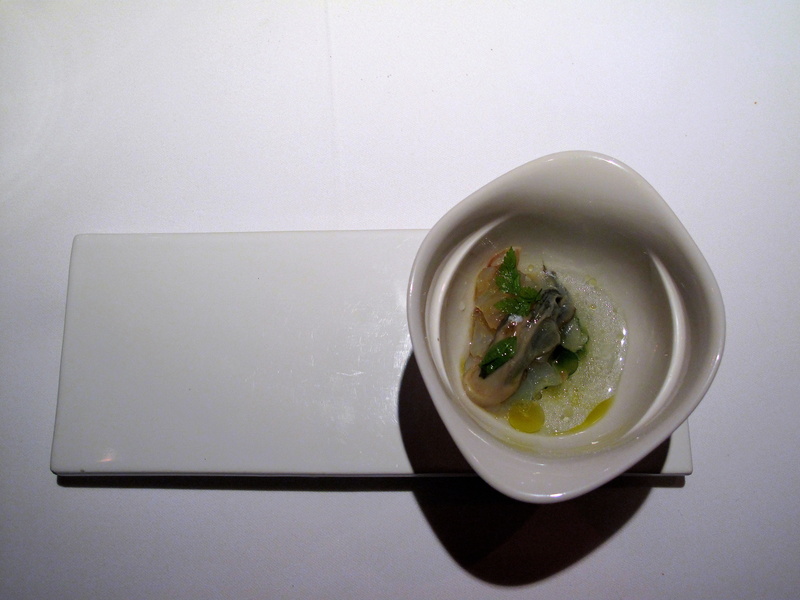 Amuse Bouche 2: Tasse d’eau de mer. 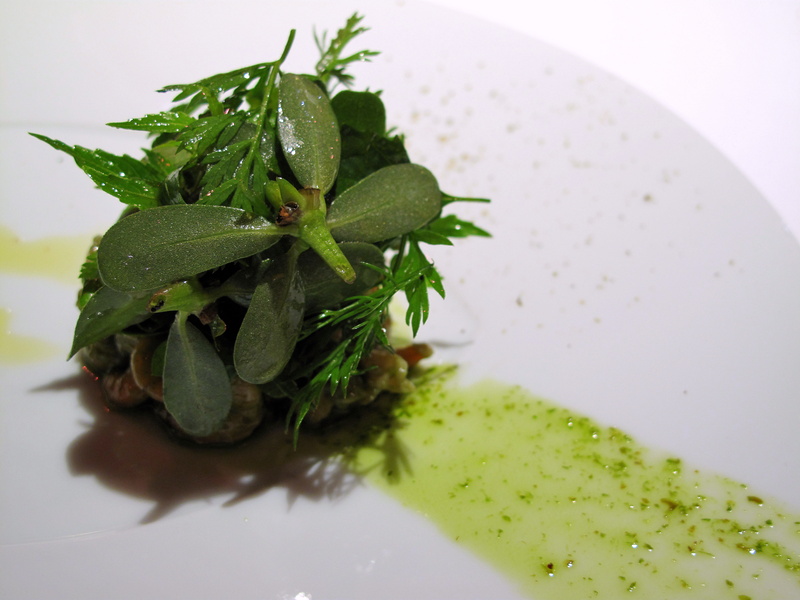 A small glass held slivers of rouge-tinged raw sea bass, oyster, steamed spinach leaf, olive oil and sprigs of chervil and basil. 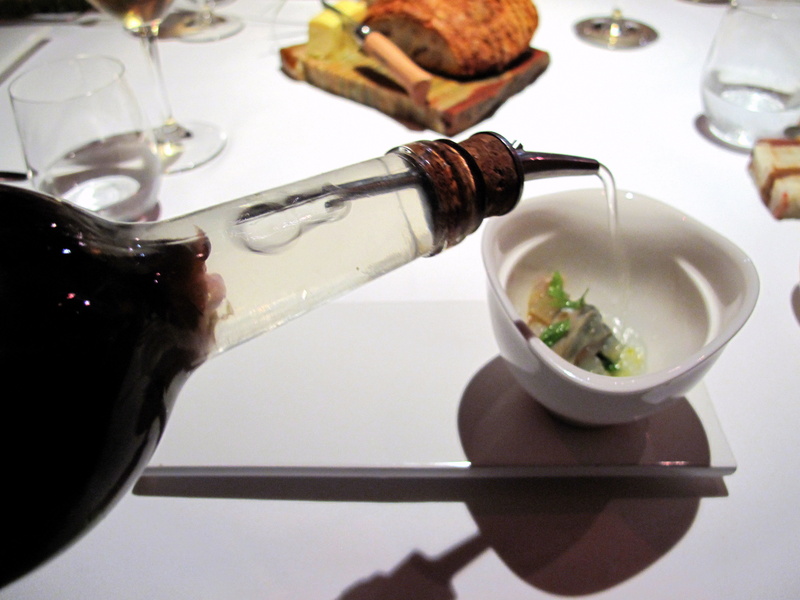 Into this, a dram was dispensed from a bottle plugged with a shot-measure pourer and containing mineral water infused with wakame, nori, lemon and sel gris de Guérande. The bottle, with its cloudy contents, looked as if it had been filled straight from the ocean – and it tasted like a shot of the sea. The aquatic aroma struck first, giving way to the briny savour and distinct textures of fish and oyster, each enlivened by salty spinach and lightly acidic lemon. 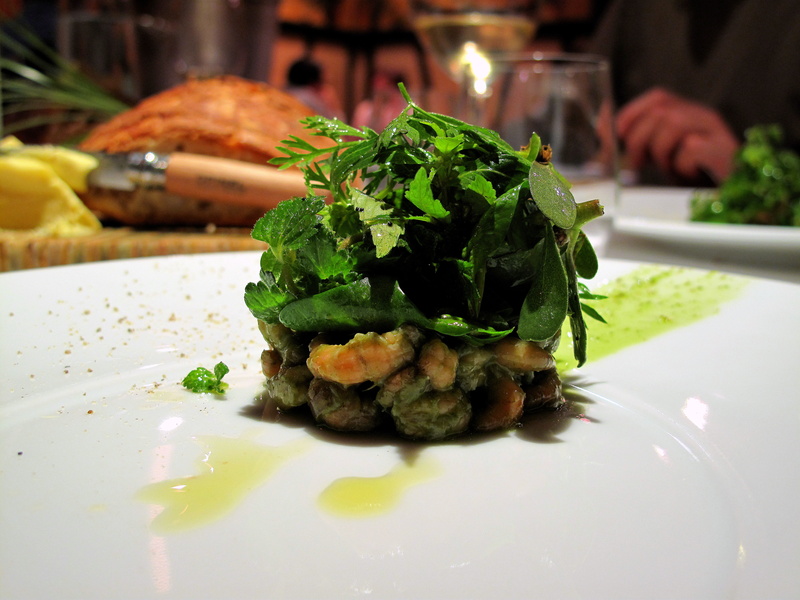 A final bite of basil and chervil left a refreshing linger on the palate. Les Pains: Pain blanc et de seigle. 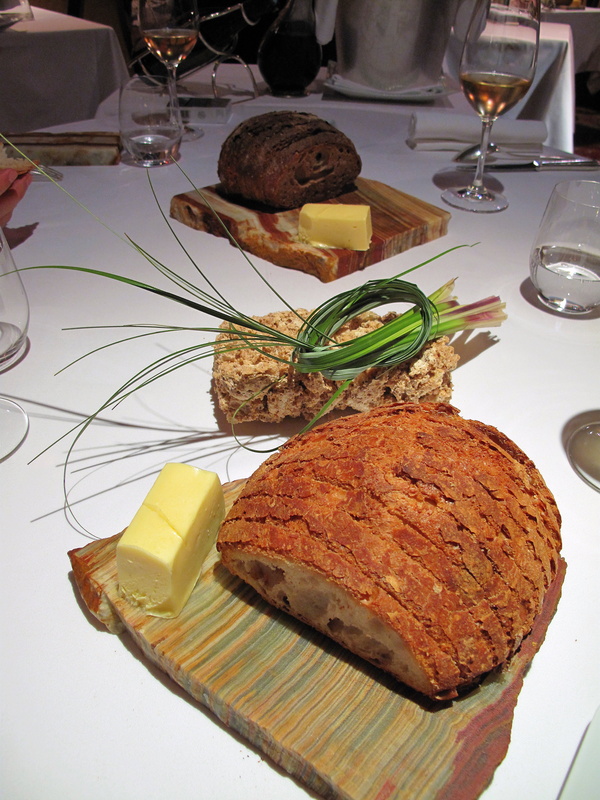 Two whole loafs of homemade bread – one white, the other rye – were placed on the table upon their own colourful stone serving slabs, each replete with a block of local beurre demi-sel askew set and already inset with wood-handled Opinel. 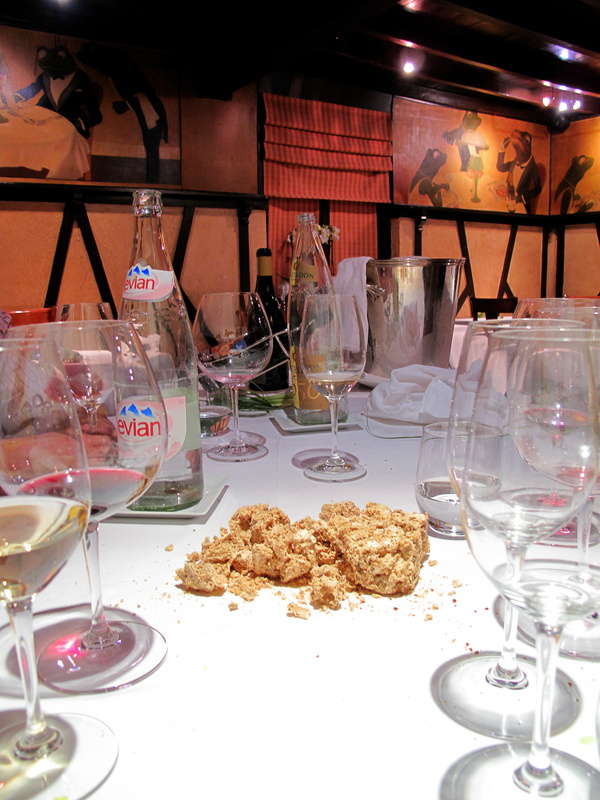 The blanc was soft, fluffy and had nicely open crumb whilst the seigle was firmer and crustier. Entrée 1: Mauvaises herbes…crevettes grises. Onto a plate, empty except for a smear of pressed herb jus and signature sprinkling of white pepper, a sterling silver ring mould was placed. A meticulously assembled mass of green herbs emerged from this collar which, when removed, also revealed a tightly packed circular stub of brown shrimp. These small, tasty crevettes, covered in the same jus, were an excellent match for the ‘lowly’ salad of nicely lemon seasoned wild herbs – a well chosen collection of aniseed-like chervil; salty purslane; crisp carrot tops; and fresh salad burnet. 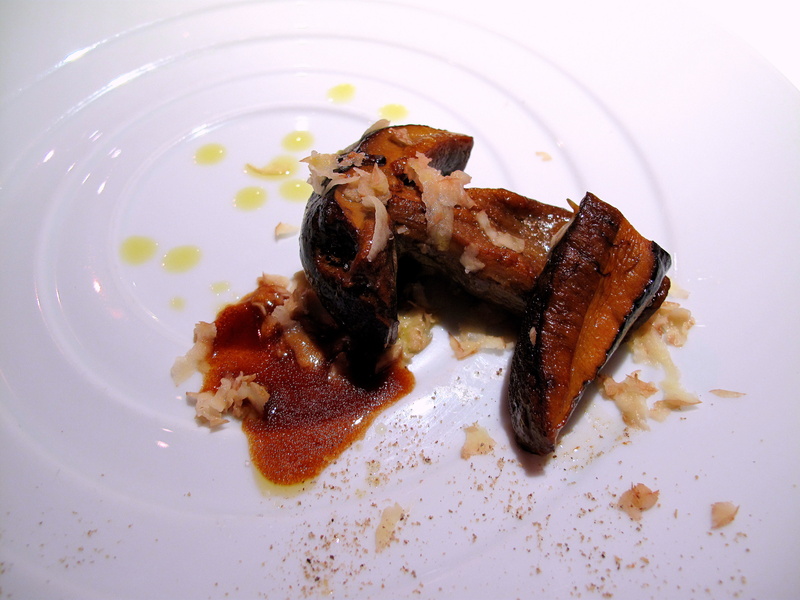 Entrée 2: Saint-Jacques, radis noires, blanc neige. 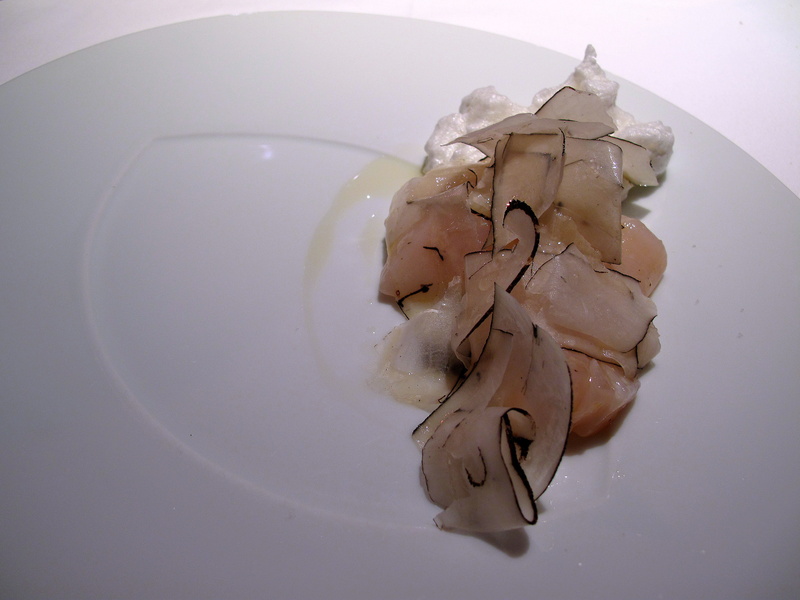 A diminishing daub of blanc neige, semi-covered with cubes of raw scallop and wispy ribbons of black radish, ran tangent to the dish’s inner rim; over all, a little grilled peanut oil was drizzled. 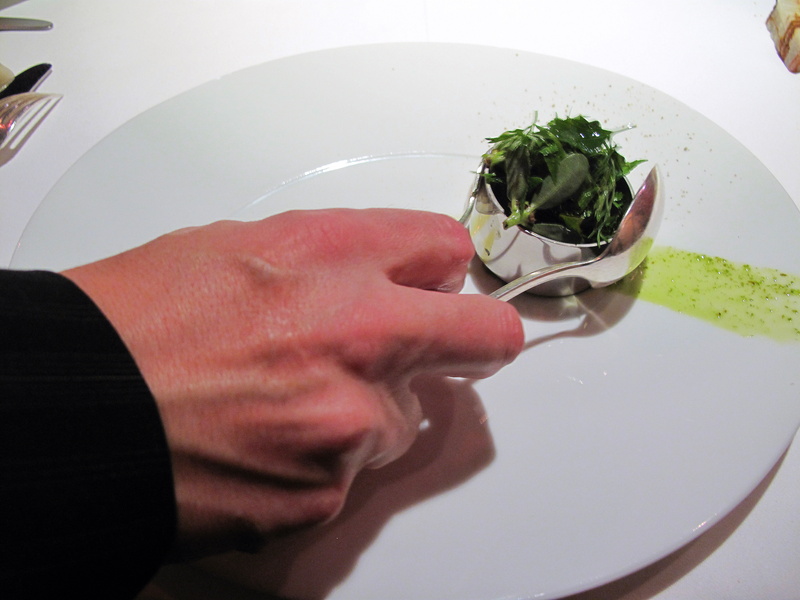 The presentation was a picture – everything white and cream disturbed only by the faintest black lines that once formed the vegetable’s exterior. 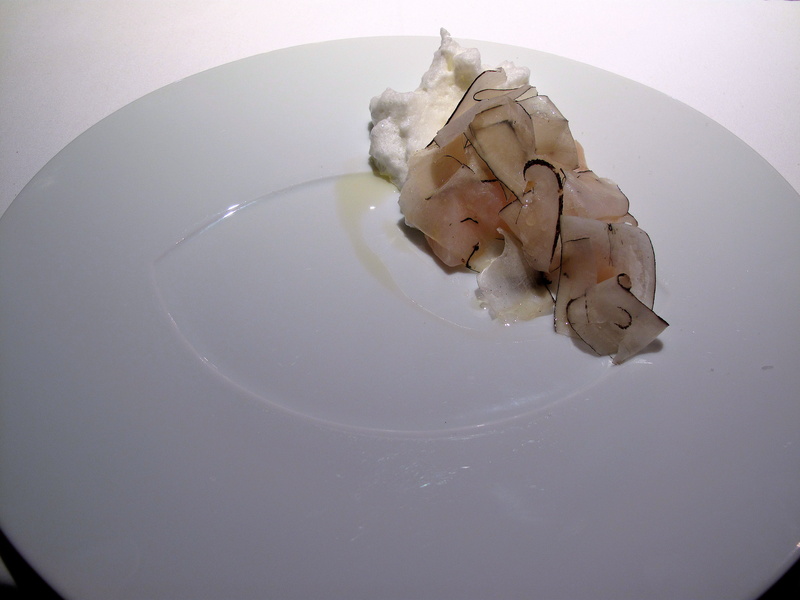 The creamy shellfish were of real quality, their natural sweetness reinforced by the tenacious foam and radish; the nutty oil also had surprising presence. Nevertheless, overall this course was somewhat unbalanced – the different components hitting not necessarily a discordant note, but not an accordant one either. Entrée 3: Oeufs de caille, choux de Bruxelles, raisins. 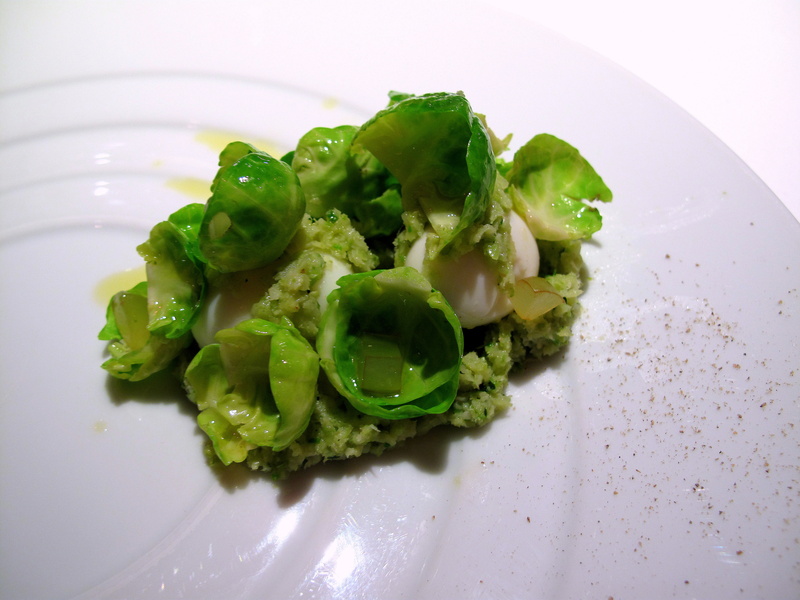 Upon a bed of crushed Brussels sprouts were set two small quail eggs overlaid with single sprout shells; grated garlic, scattered with tiny squares of diced grape, covered these. The cabbage with its delicate sweet nuttiness, complemented by the mild garlic and grape, was enriched by the brace of bright, white soft-boiled eggs. The still runny, intense yellow yolks also worked well texturally and visually with the green and grainy mash and crisp sprout skins. Entrée 4: Saint Jacques brûlées, pleurote vapeur. 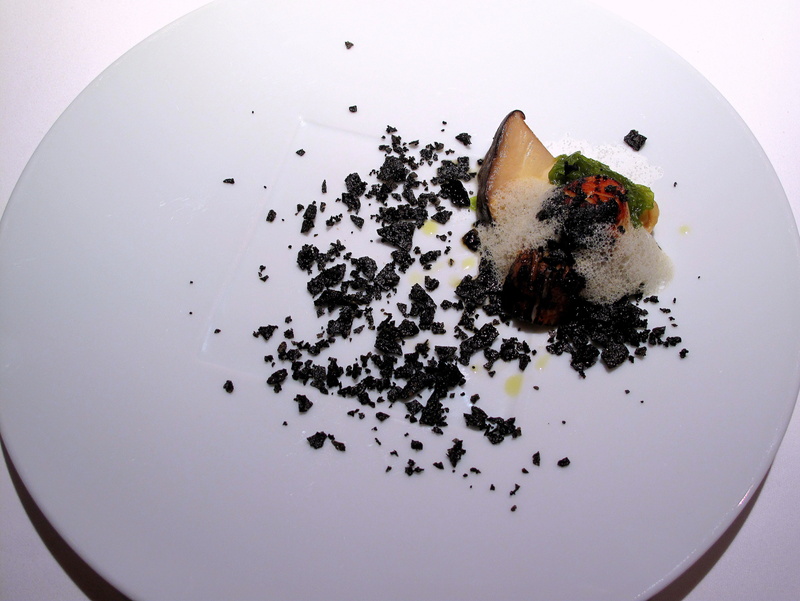 The middle of the plate was peppered with burned and broken chips of potato stained with squid ink; off to the right, the large, central sliver of a pleurote supported some seaweed and a strongly caramelised scallop surrounded by an emulsion of its own cooking liquor. The presentation was poignant, suggestive of a scene from the aftermath of a fire. 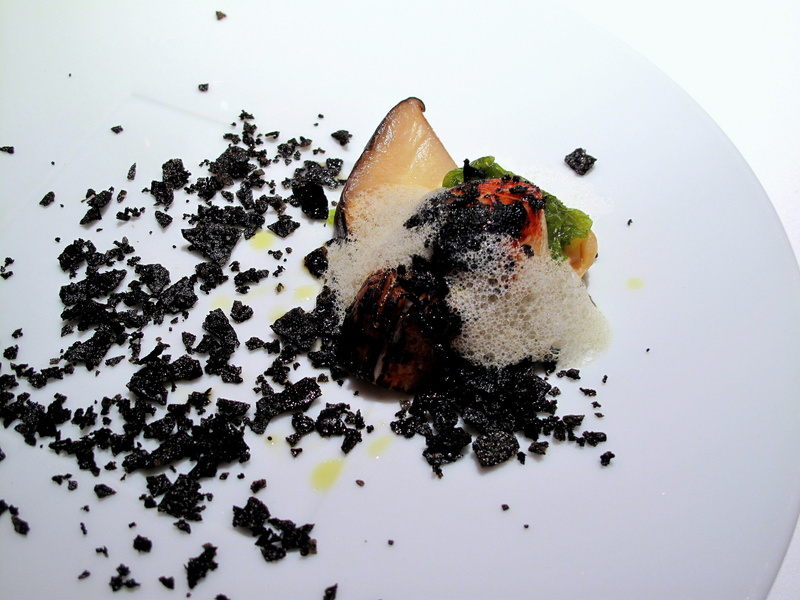 The debris-esque potato added crunch and roasted savour to the pleasingly meaty, steamed mushroom and sweet, soft scallop. A marine theme was maintained throughout too by the ink, shellfish, seaweed and oyster mushroom (even if with the last it was only nominal). Entrée 5: Gnocci aux citron et epinards a la beurre. 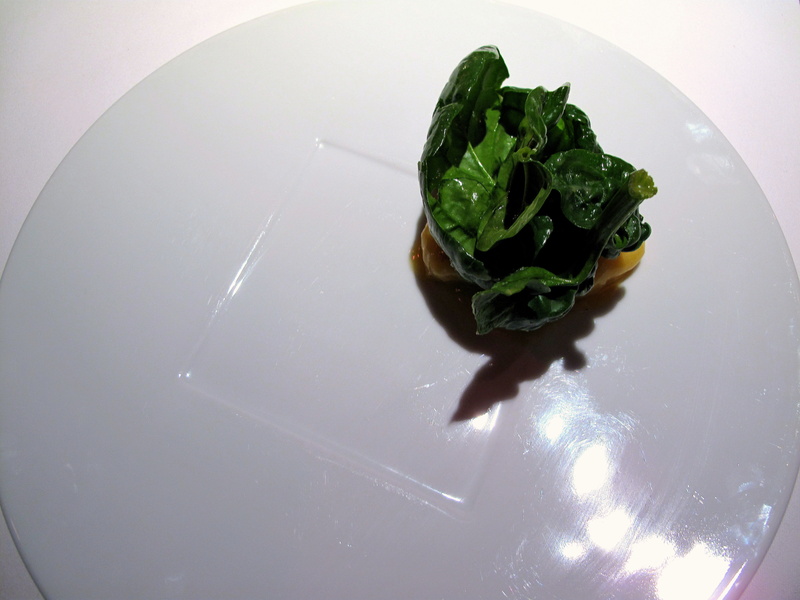 A trilogy of golden gnocchi, steeped in lemon butter, arrived almost obscured by a couple of large, overlapping leaves of nearly raw spinach. The tense, barely bitter blades tendered relief to the acidity of the lemon and crunch against the soft graininess of the light pasta. These three, simple ingredients tied together superbly. 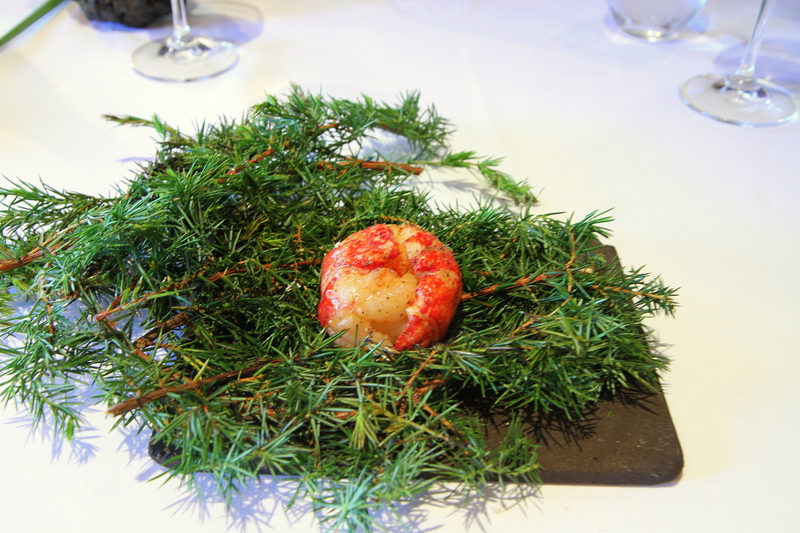 Plat Principal 1: Homard Genièvre. A barely perceptible pink coil lay secreted within scentful shrubbery. 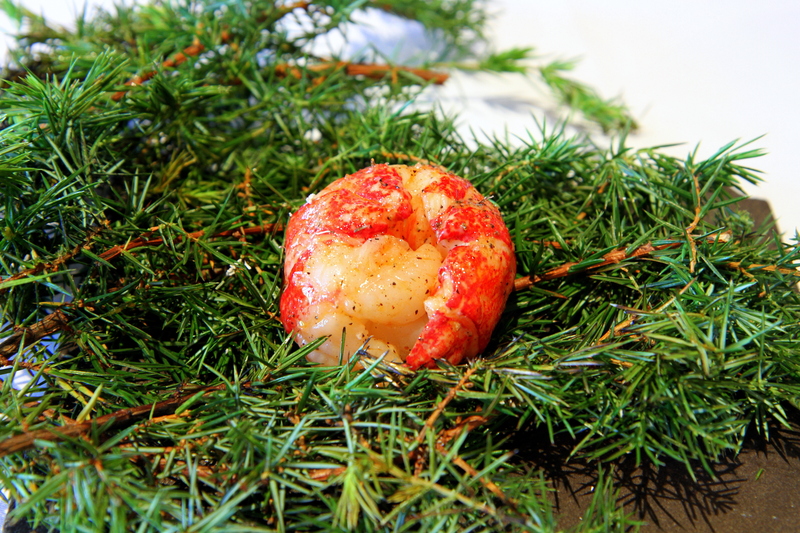 Separating the stems exposed a whole lobster nestled like a foetus. Poached for forty-five seconds it had been smeared with juniper butter that had already melted. This blue lobster had tremendous sweetness whilst the cuisson – it had really merely been warmed – was incredible. The shellfish retained its moisture and suppleness and, eaten with one’s fingers, was messy satisfaction. 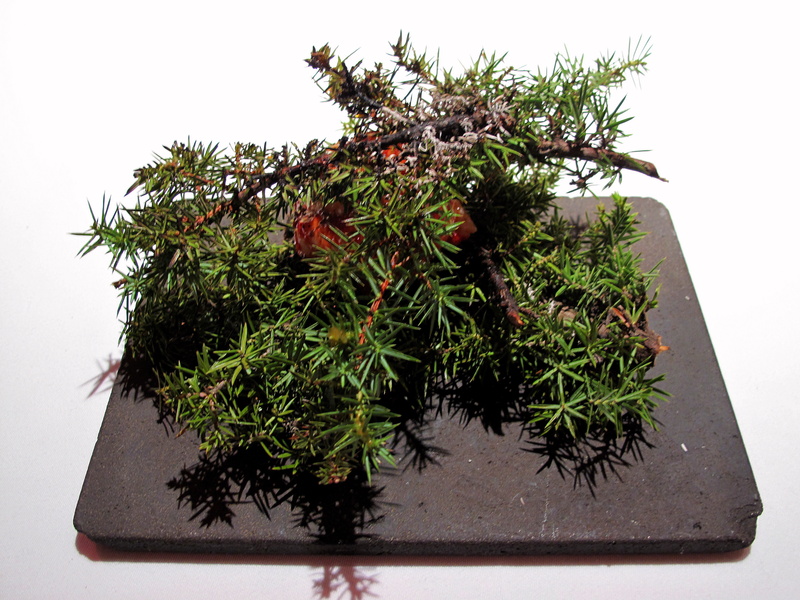 The bittersweet juniper was a lovely counterpoint: some of the charred berries, still attached to the boughs, tendered hearty bursts of flavour. 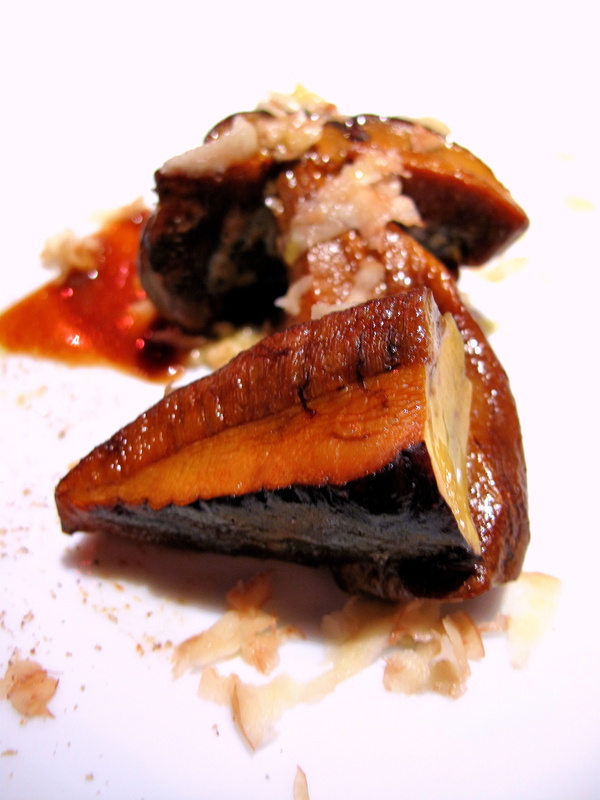 Plat Principal 2: Encornet, figues. 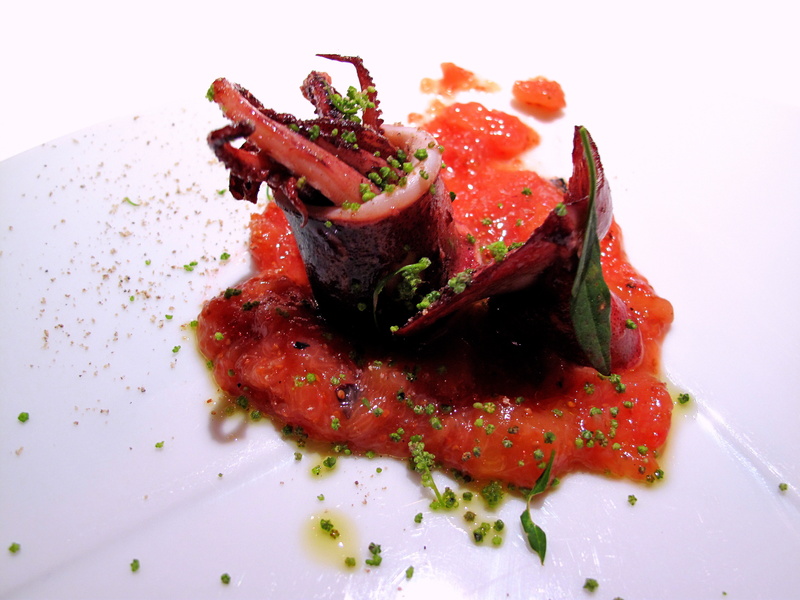 In one corner, a whole pan-fried squid, its beheaded head prone besides its standing bottom half brimming with its tentacles and sprinkled with fresh chive, was placed upon a purée of fig. Vivid scarlet, this last element made it seem as if the bisected shellfish had bled over the porcelain. Albeit whimsical in appearance and individually agreeable, the squid (pleasingly tender) and the fig (gently sweet and touched with spice) failed to strike a successful chord altogether. Yet, it might be worth mentioning that the original recipe called for pig’s blood sauce instead of this fruity one – the substitution being the forced result of dietary requirements. Plat Principal 3: Bolet à pied rouge, pomme de terre crue râpée, jus de veau. 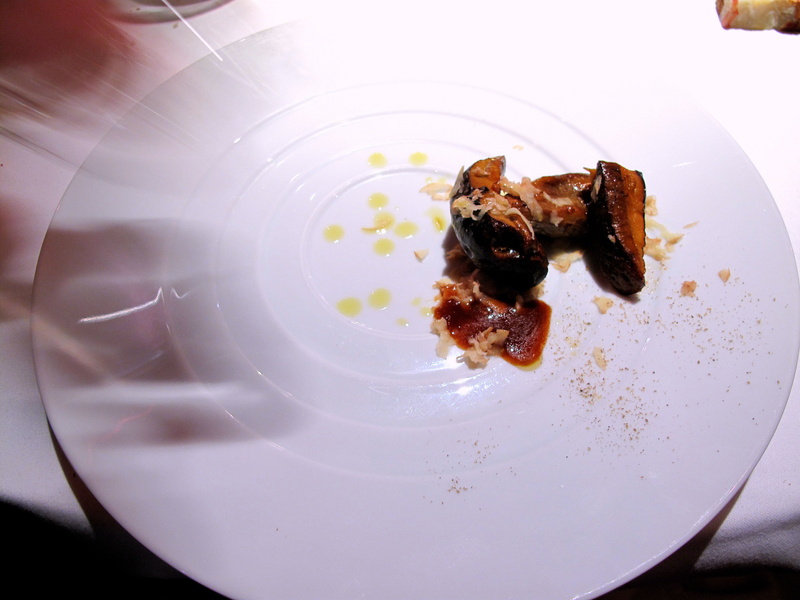 Half of a much-smaller bolet was ultimately served accompanied by a portion of the cap of a larger one, raw shavings of potato and a tableside spoonful of veal jus. The pan-fried mushroom – a beautiful specimen comprising almost every shade of orange from flame to tenné to dark brown – was plump and succulent with subtle, sweet relish. Uncooked potato was an uncommon addition, but brought crunch and some refreshment against the meaty sauce. Plat Principal 4: Vachette, purée d’ail grillé. 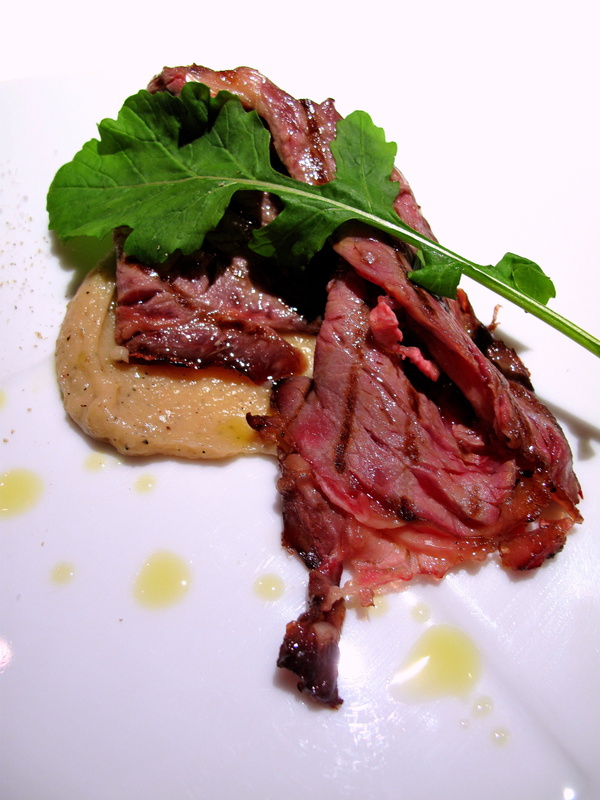 A thin, sheet-like slice of entrecôte from a young cow had been spread over a splash of grilled garlic mash; a single, pristine rocket leaf lay over the beef. Sourced from a neighbouring farm, there was more to this meat than initially met the eye – it had been charred on one side, but left raw on the other. This gave an additional dimension to the tasty and juicy cut. Bearing hints of barbecue, the garlic was a classical companion to the steak whilst the green, welcomingly peppery. Pre-dessert: Gâteau de miel avec citron. 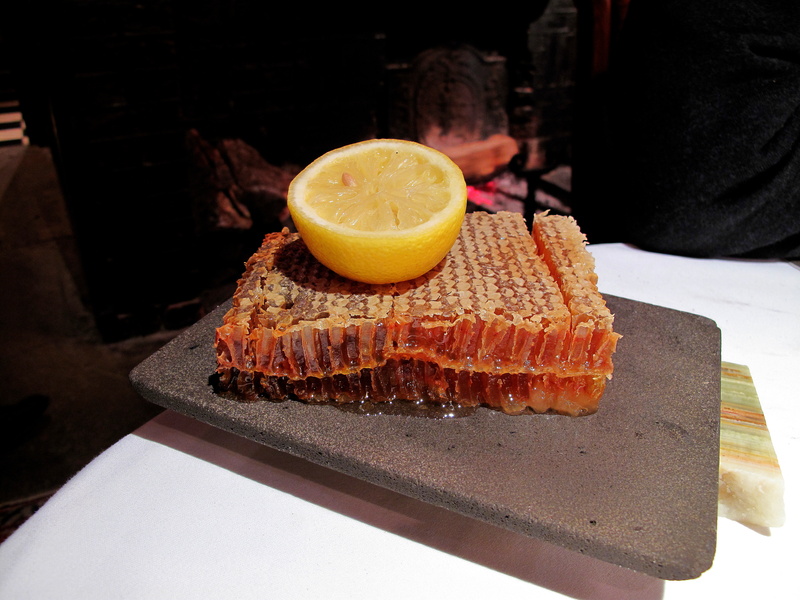 Two thick tiers of honeycomb, dripping with honey made by bees living off local blossoms, were delivered by Pascal, who then toured the table, portioning off a waxy morsel for each guest, dousing it in lemon before allowing it to be taken. This did well, cleansing one’s palate before desserts began. Dessert 1: Chataigne-pain brûlé. 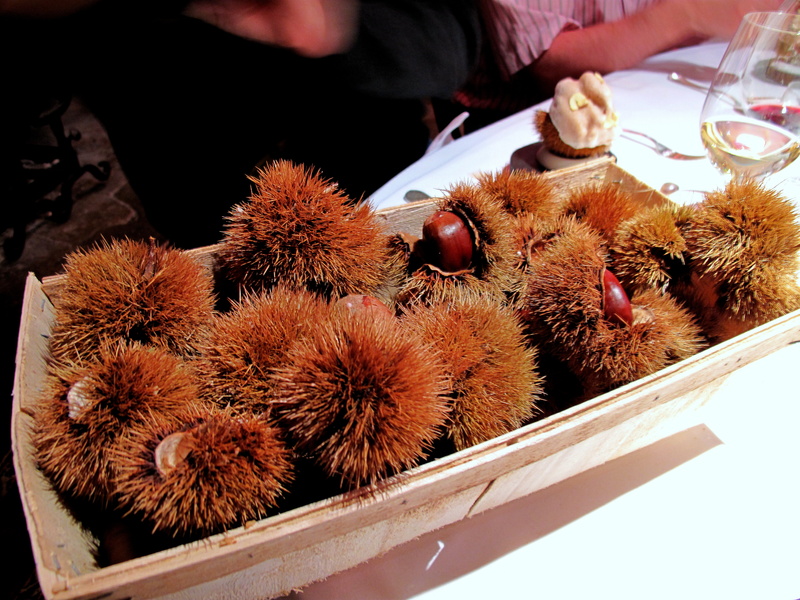 A small, wooden chest of cracked-open chestnuts came next, out of which, one was set standing afore each diner. 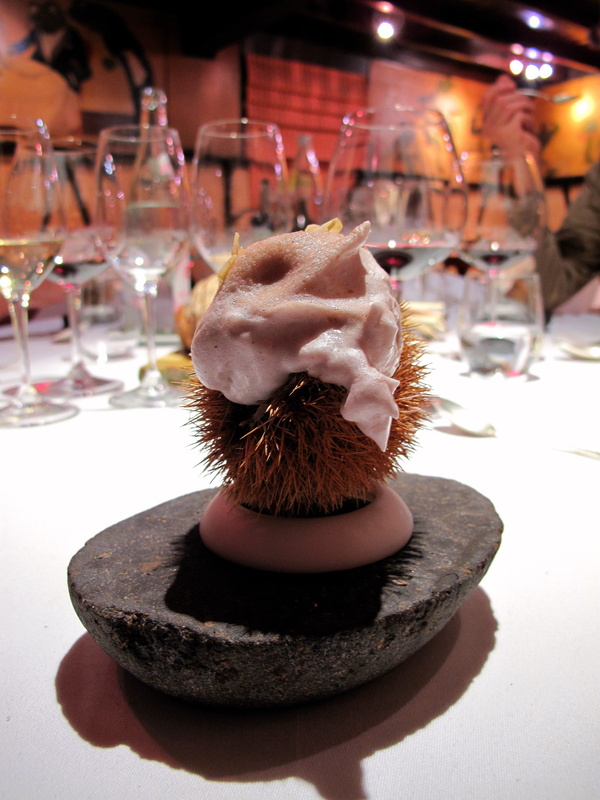 The spiky, brown shell sat stuffed with slightly charred chestnut meringue speckled with crunchy chestnut pieces. Delving beneath this brim exposed a smooth ice cream centre around broken bits of the caramelised nut. 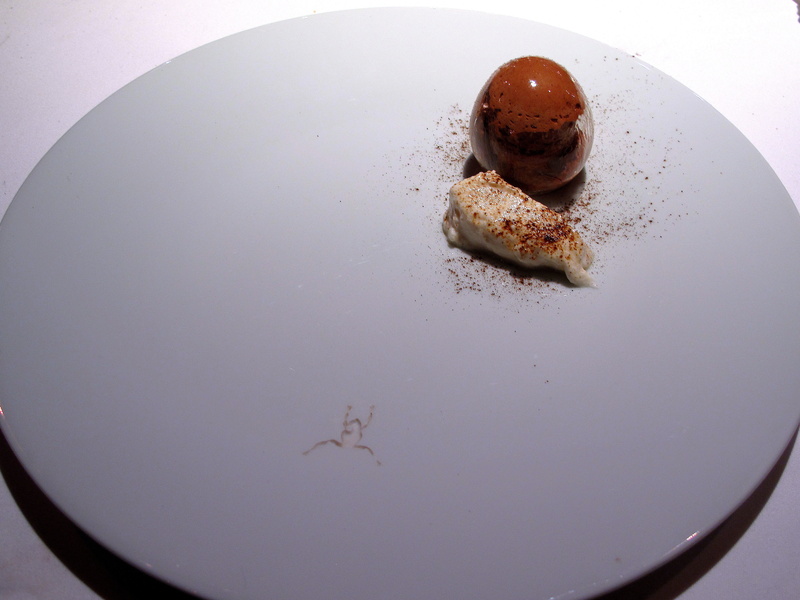 Dessert 2: Boule chocolat/chircorée. 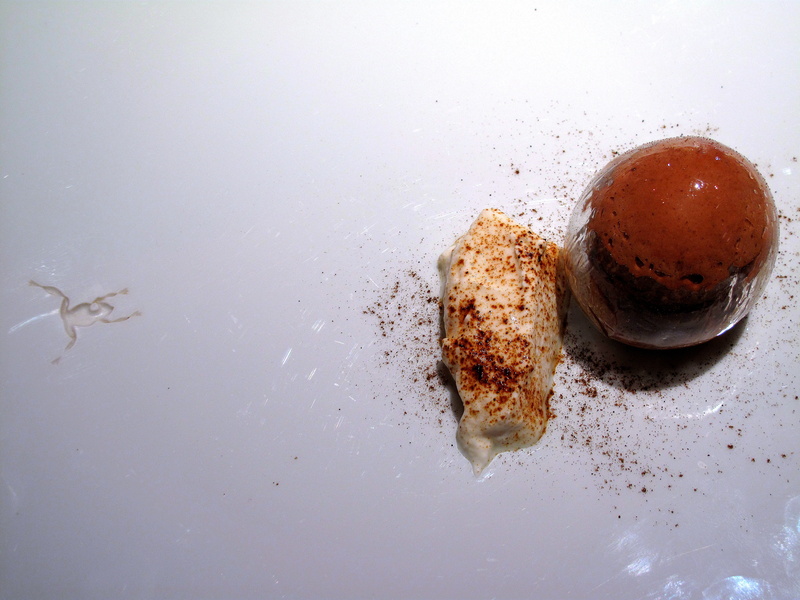 A delicate sugar-glass sphere encased milky chocolate ice cream and sat adjacent to a scoop of thick yoghurt; chicory had been grated over both. Easily smashed open with one’s spoon, the sugar melted in the mouth, contrasting well with the barely bitter-citrus herb. Meanwhile, the yoghurt and chocolate – sour and rich respectively – made excellent counterpoints. Dessert 3: Coing-pomme. Dense crème, semi-wrapped with quince jelly came bestrewn over with nearly dehydrated, diced Boskoop apple peel: the lightly-coloured cream was set off by vibrant orange-red gelée that was paralleled by the apple’s rusty skin. The quince, reminiscent of membrillo, was good quality and partnered the dulled sweet-tartness of the juicy Dutch apple very nicely. 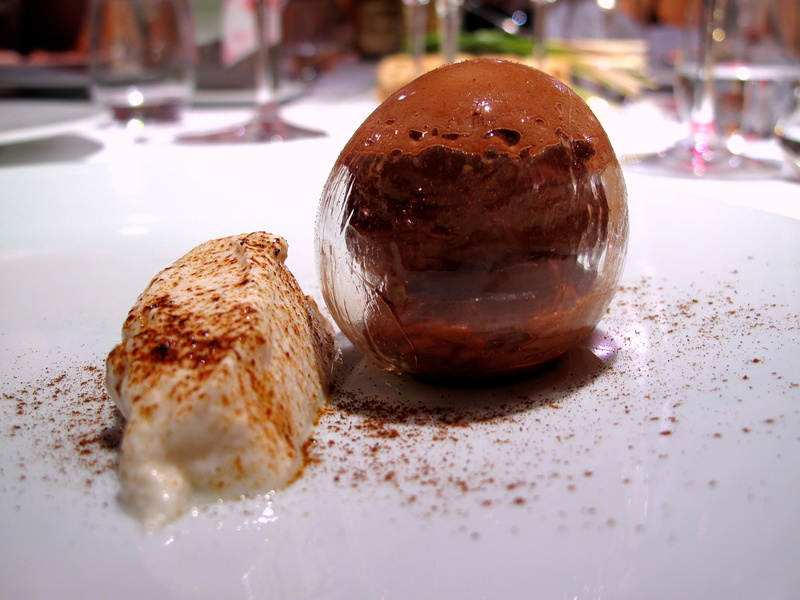 Dessert 4: Boule oseille. 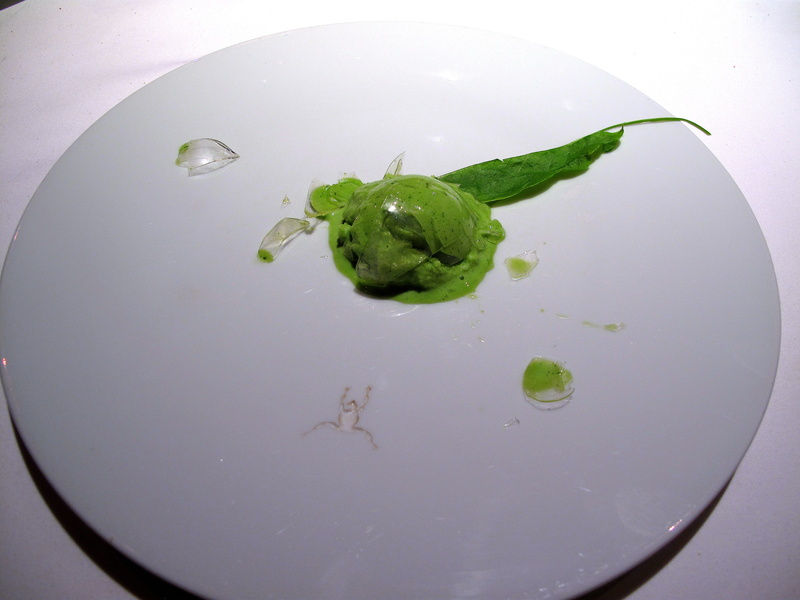 A plate was presented bearing nothing but a single bright blade of sorrel – the top of its stem dangling over the dish’s edge – prior to Pascal’s appearance with a platter of green ice cream-filled globes. Ready with a pair of tongs, he approached and prepared to place each of these before each guest. But suddenly, whilst still half-a-metre or so from the table, the first ball fell from his forceps and smashed against the centre of the almost empty ceramic. Whilst the startled guests all gasped, he calmly continued delivering this last dessert this manner. 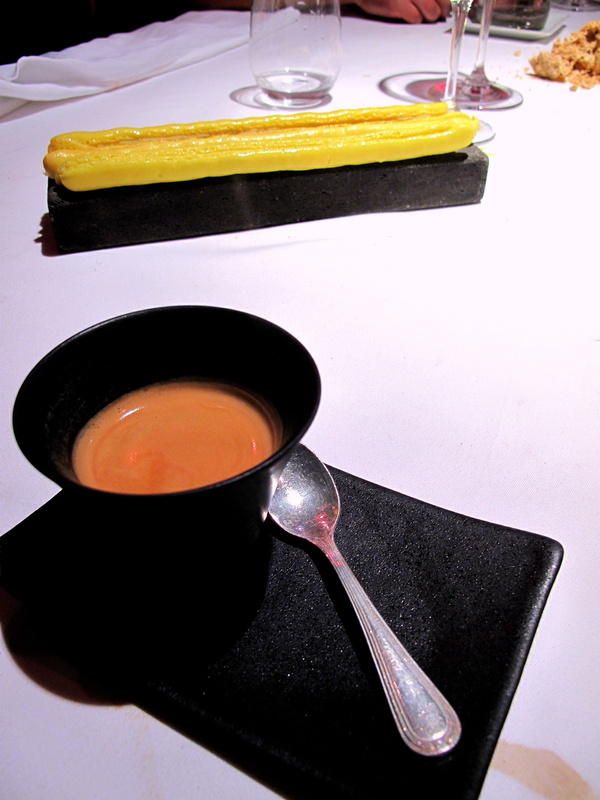 The effect was immense and the ice cream itself was light yet satisfying, brilliantly poised between sweet and acidic. Petit Fours: Meringue et ananas guimauve. If the preceding course shocked, the final surprised. One of the staff produced a hammer and small chisel with which he proceeded to break open the piece of porous rock that had remained idle and long-forgotten in the middle of the table that entire evening. 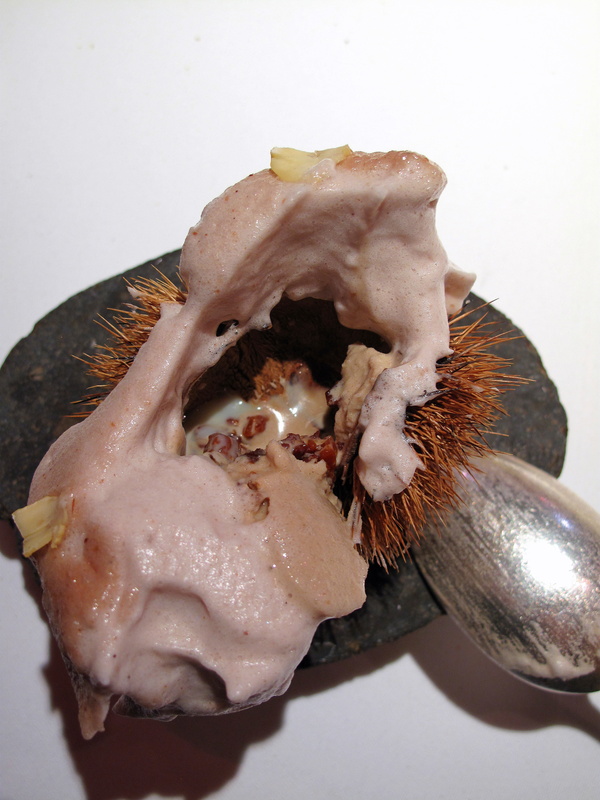 What was assumed simply something cosmetic was exposed as in fact crumbly, moreish hazelnut meringue. Lines of luminous pineapple candy were a tart supplement. 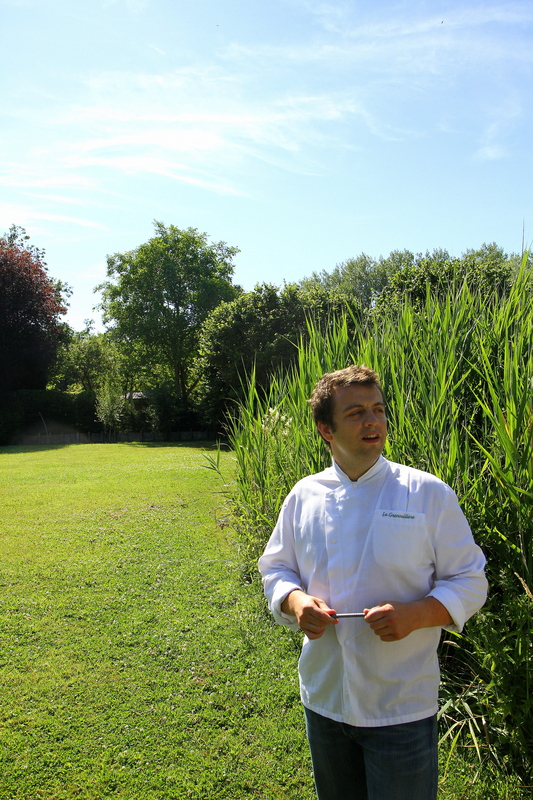 Pascal, who runs la Grenouillère’s front-of-house, was excellent. Attentive, engaging and more than convivial, he was a superb host. He was also supported by a team of friendly and efficient staff whilst the atmosphere at the restaurant was certainly absorbing: there was an ambient warmth to the comfy dining room with its soft lighting and tongue-in-cheek furnishings. 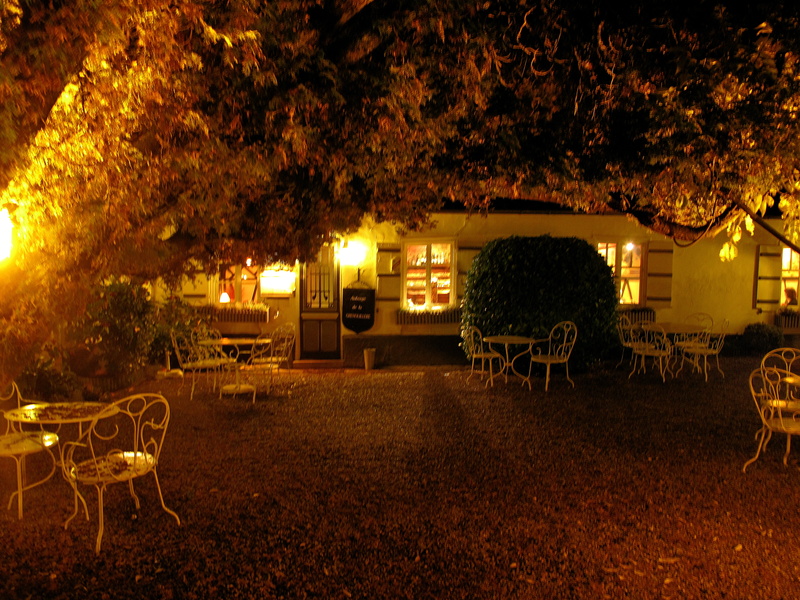 Together with the relaxed service, everything was ready for an easy, smooth experience. Furthermore, the traditional yet enduring surroundings were a stark, but charming contradiction to the contemporary nature of the cookery – although, given that the chef’s approach pends on contrast, this inclusive juxtaposition is nothing if not fitting. 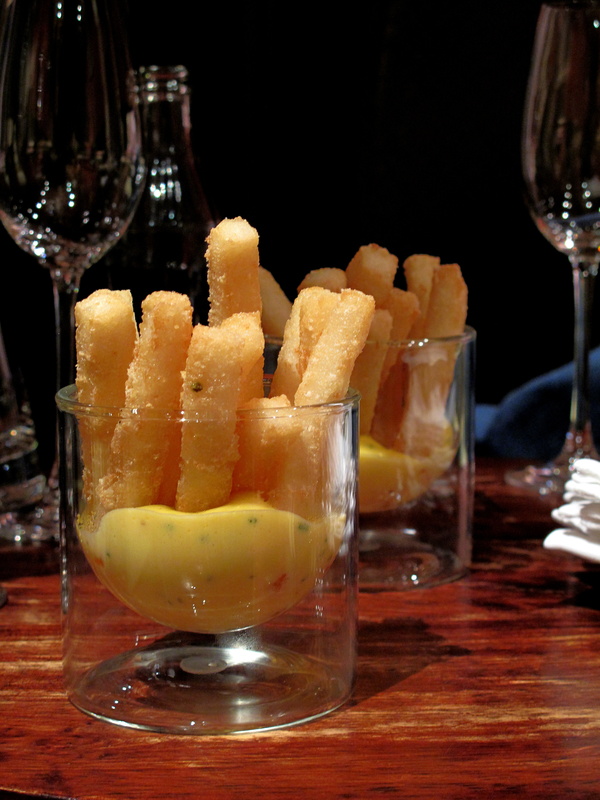 First to arrive were snacks of riz frites, sauce hollandaise, ahead of the chef’s autograph amuse, tasse d’eau de mer. 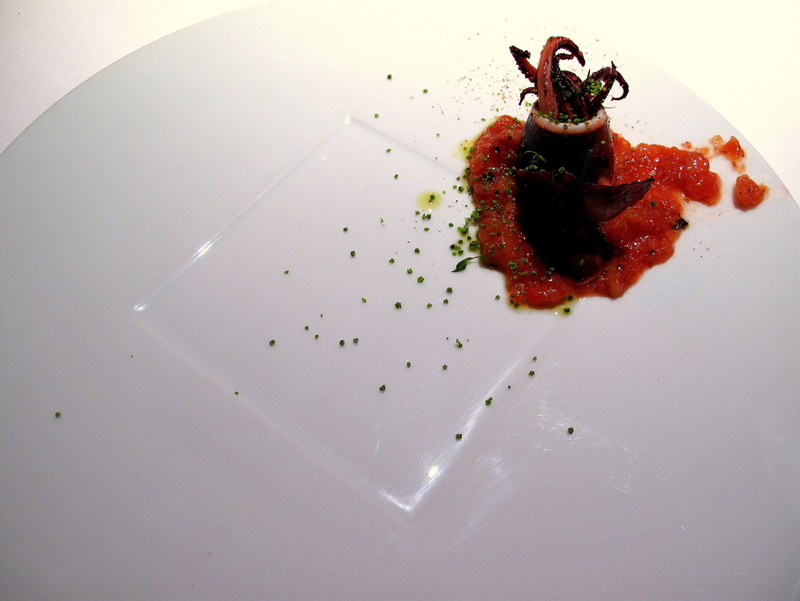 With these consecutive couple of dishes, Gauthier demonstrated an essential detail of his cooking: it is a cuisine founded on the local and punctuated by the exotic. 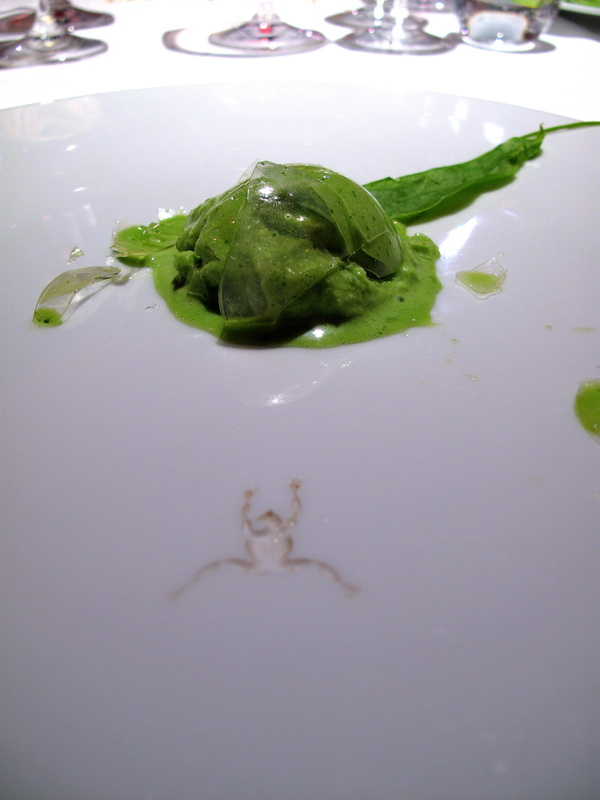 Crevettes grises and their abettors of oft-leftover (and so fancifully hailed ‘moody’) herbs exhibited his humorous side, whilst the all-alabaster Saint-Jacques, radis noires, blanc neige showed a keen and engrossing attention to appearance. 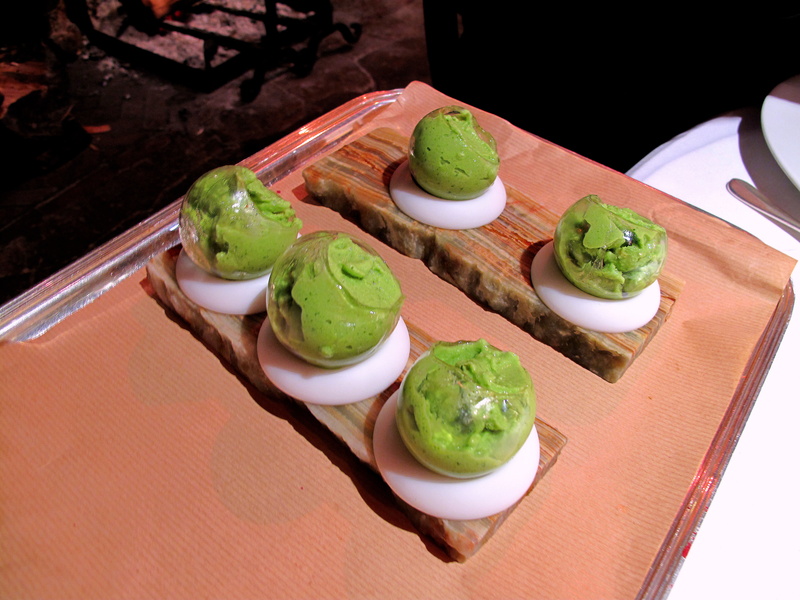 From blank and white to bright green, the subsequent oeufs de caille, choux de Bruxelles was perhaps the tastiest course yet. 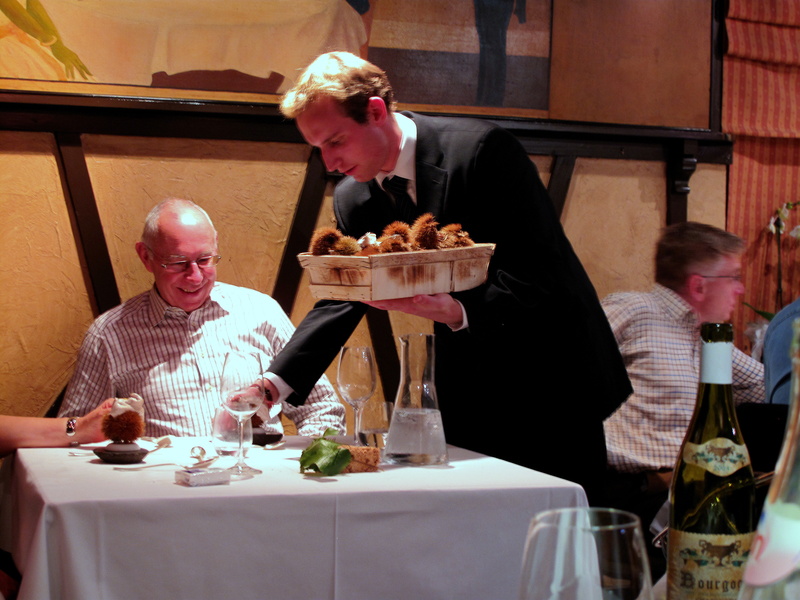 The visual continued to delight with the simple seeming gnocchi that were really quite satisfying, after which came the immensely gratifying homard genièvre before the weakest plate of the meal – encornet, figues. 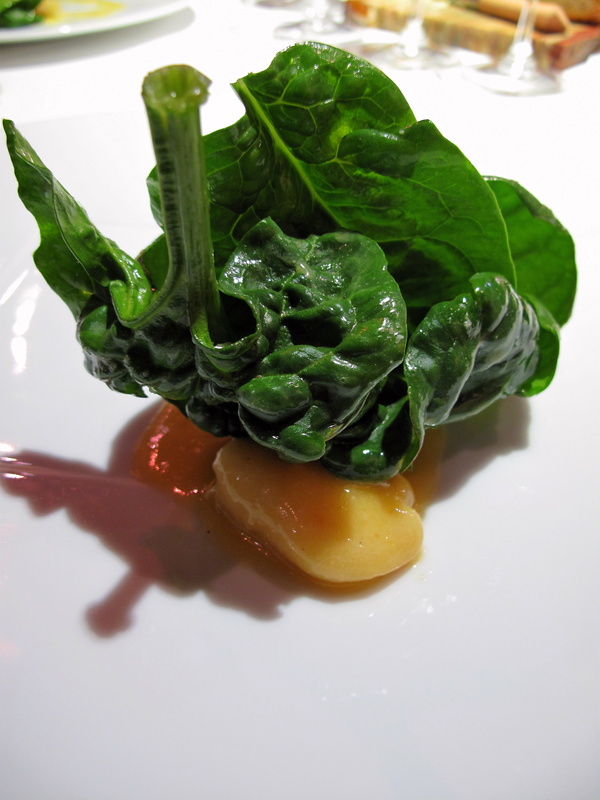 However, disappointment was spared by the vachette, purée d’ail grillé, which was both toothsome and interesting at once. Desserts did not demean the standard already set. Chataigne-pain brûlé, amusingly meted out, was very good and the coing-pomme, even better. 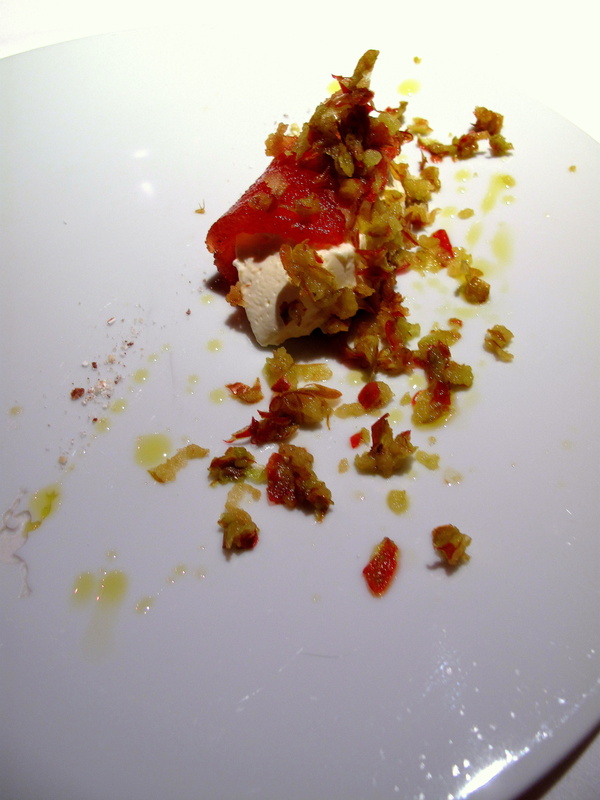 Whereas, the final sweet, the boule oseille, and especially the way in which it was served was a delicious moment. Without doubt the most outstanding and exciting characteristic of Alexandre Gauthier’s cuisine is his willingness, his eagerness to explore things unfamiliar – to question what others readily accept as absolute. 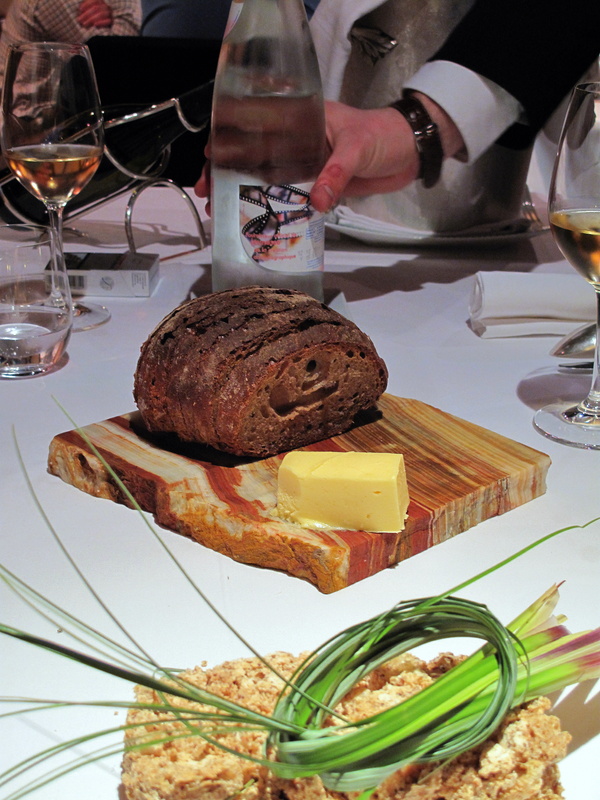 These traits were manifest predominantly in two respects – presentation and ingredient/flavour pairings. Both in assembly and on arrival, dishes were designed to attract attention and incite curiosity. With regards to delivery, the chef went beyond conventional, straightforward service and the customary tableside addition of saucing to bring another feature to courses. 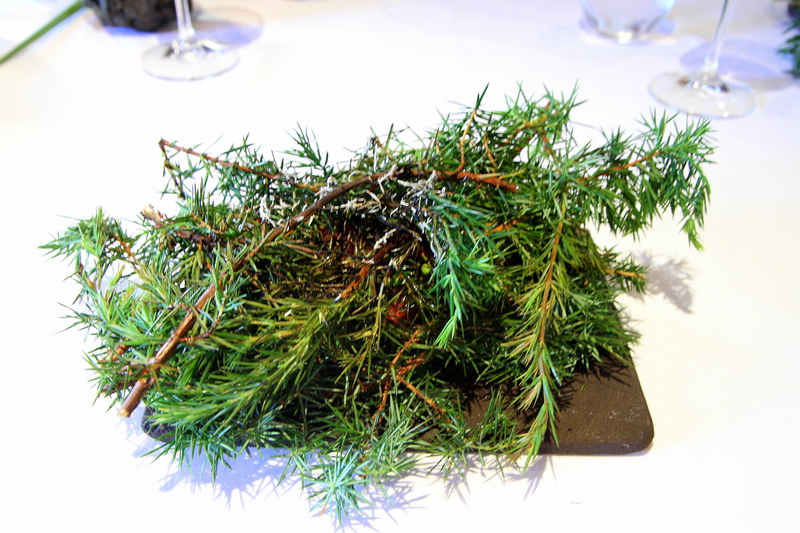 One standout instance of this was the smoking juniper bush – its smouldering boughs laden with succulent lobster – whose enticing scent worked to arouse one’s appetite ahead of the food’s actual appearance. Even more memorable was the advent of the last dessert; the utter unexpectedness of the smashing sorrel ice cream and the fleeting, funny confusion amongst those at the table that followed remains unforgettable. 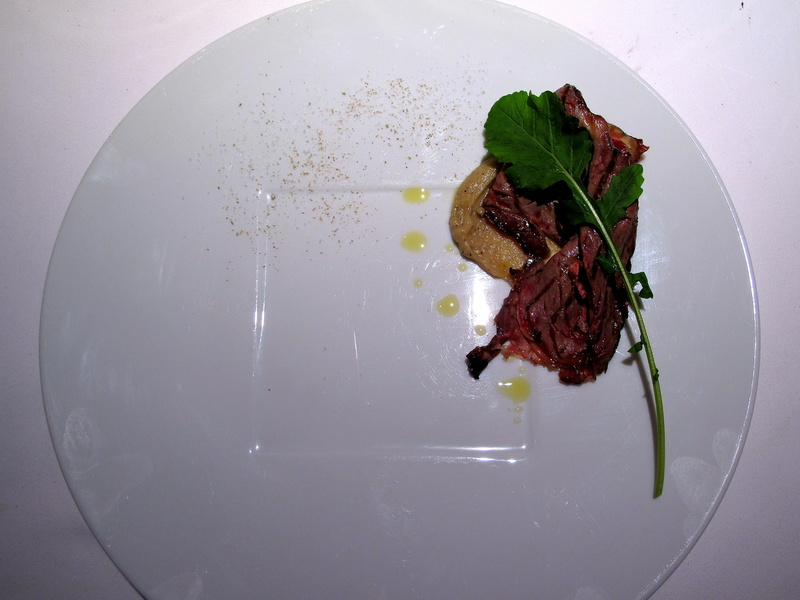 Gauthier’s distinctiveness does not end there: the plating is definitely – defiantly – different too. 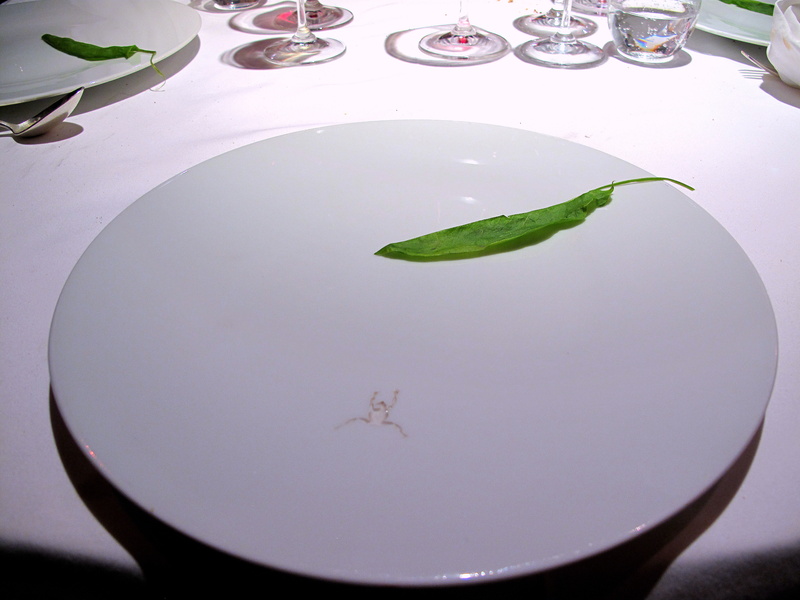 The chef’s signature is obvious: minimalist servings concentrated on a single part of the plate. It is an approach so simple yet so striking. Whilst nearly every other recipe, everywhere else revolves around a dish’s centre, Gauthier, by merely moving the focal point to one corner or side and condensing the course into only a few squared centimetres of space, immediately intensifies all the elements’ effect. It is as seditious as it is cheeky. 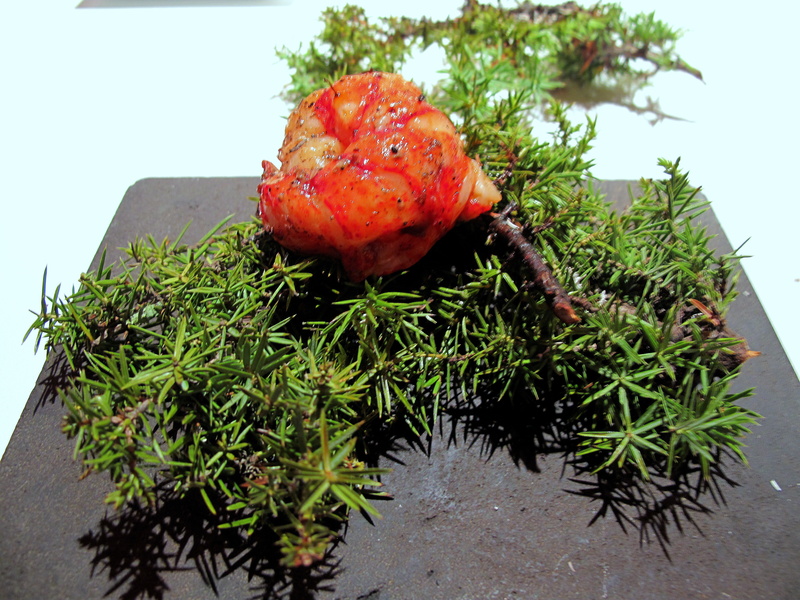 As alluded to earlier, the chef also enjoys teaming native and foreign ingredients together. 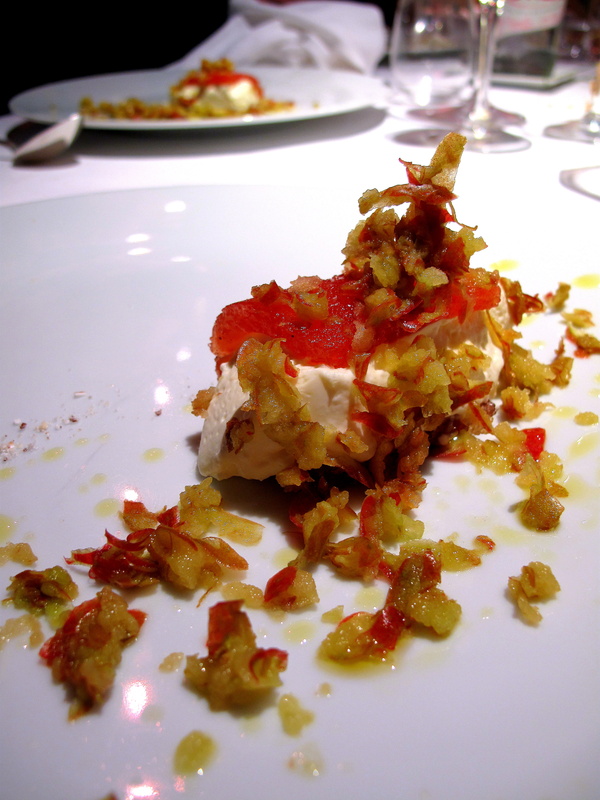 ‘Why be satisfied while others have olive oil, zucchini flowers or pomegranates? This is unfair!…I live in the north, where it’s not so rich in products. Va faire une salade d’endives extraordinaire…for me it’s about finding tangents. I do not constrain my cooking. My kitchen is constructed by adding to, subtracting from the tastes of my father…then, I focus on the technical implementation. J’aime ça. Ça rassure, la rigueur.’ Even so, he is proud to present the best of his region – local butter and milk, fish from Boulogne-sur-Mer, pigeon from Licques – whereas he rejects the term ‘terroir’ considering it confusing, preferring ‘territoire’ instead. 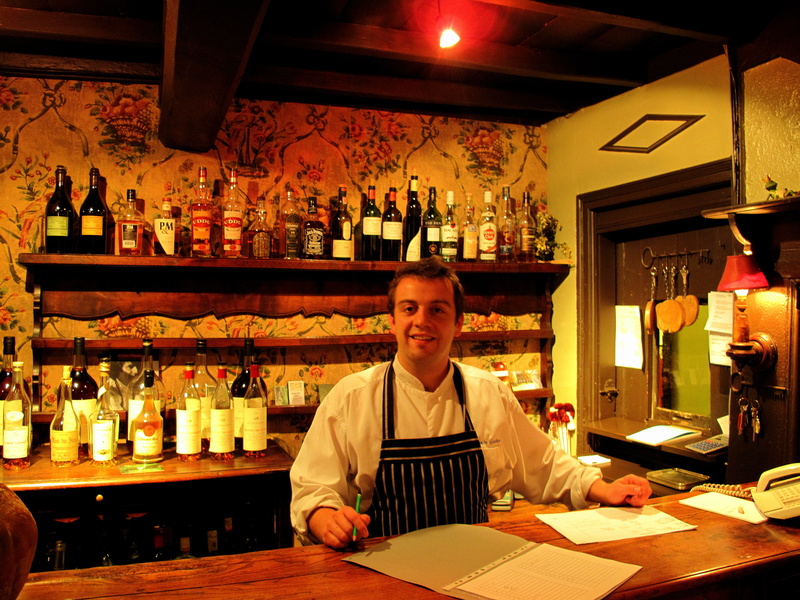 Thus he toys with old recipes, reinventing established formulas with worldly flavours. 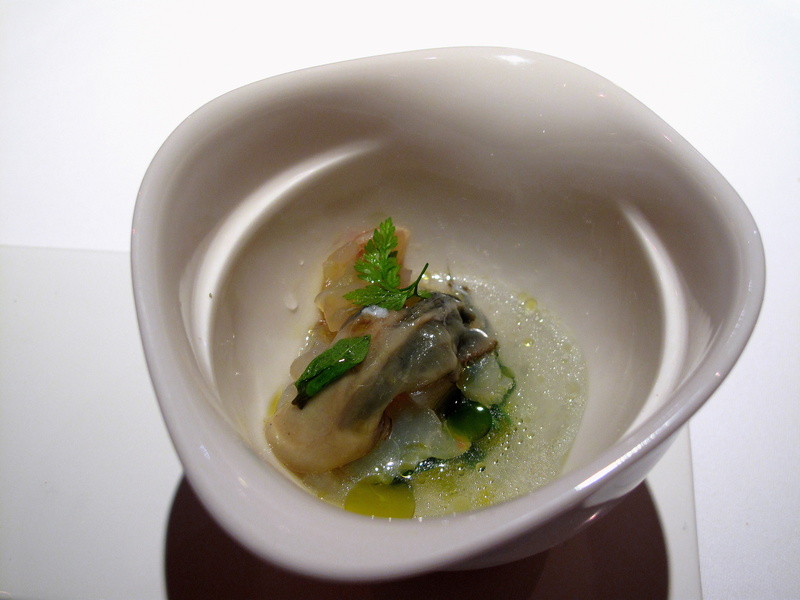 One such dish with which the chef won himself renown was clams et couteaux cuisinés à la grenade et à la mangue, which he presented at the Fou de France. 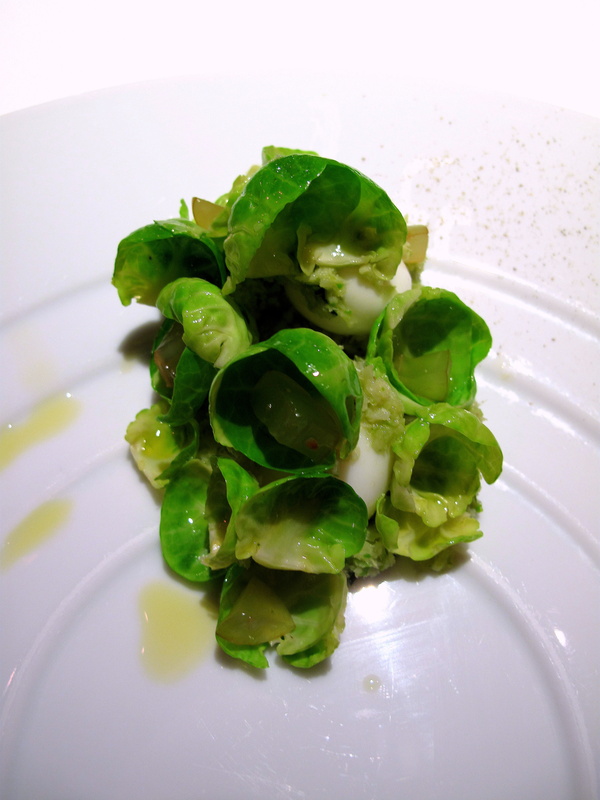 Although examples of this today were plenty too: sauce hollandaise, traditionally a complement to tall spears of asparagus, instead partnered sticks of sticky rice; quail eggs and Brussels’s sprouts were mixed with morsels of raisin; squid was smeared with fig; and indigenous apples shared the plate with exotic quince. Nonetheless, such colourful collages as these sat on the same menu as the tasse d’eau de mer that tasted like a sip of the nearby English Channel – or at least its essence, distilled down – whilst the subsequently served crevettes grises that joined the close-by-picked mauvaises herbes could have been plucked from the very same waters. 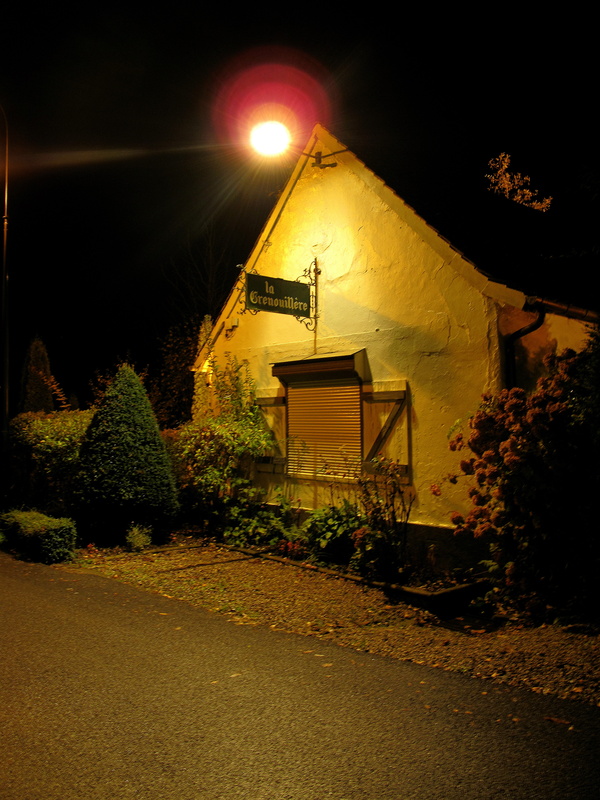 As far back as medieval times, as far away as England, Montreuil-sur-Mer was famous for its juniper-infused woodcock patés; here, Breton shellfish was imbued with the savour of this same local scrub. Whilst the wild mushrooms, sorrel and potato are all also synonymous with the area. ‘My advantage is having many learned chefs with whom I worked, but by whom I have not been ‘formatted’.’ Gauthier does offer something unique indeed. 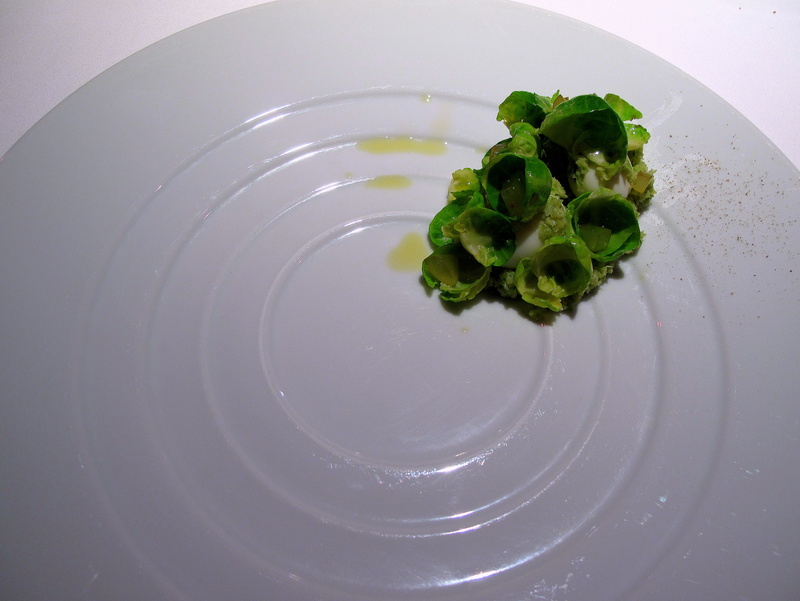 His creations rely on rigorous technique, but appear simple and are easy to eat. After my first taste of his cooking, I did feel a small measure of scepticism over whether his aesthetic approach could maintain one’s interest over an entire meal – but it did. It is something of a stroke of brilliance – a compelling and witty challenge to what the experienced diner takes for granted. Presentation was confrontational yet plates possessed confidence and energy. 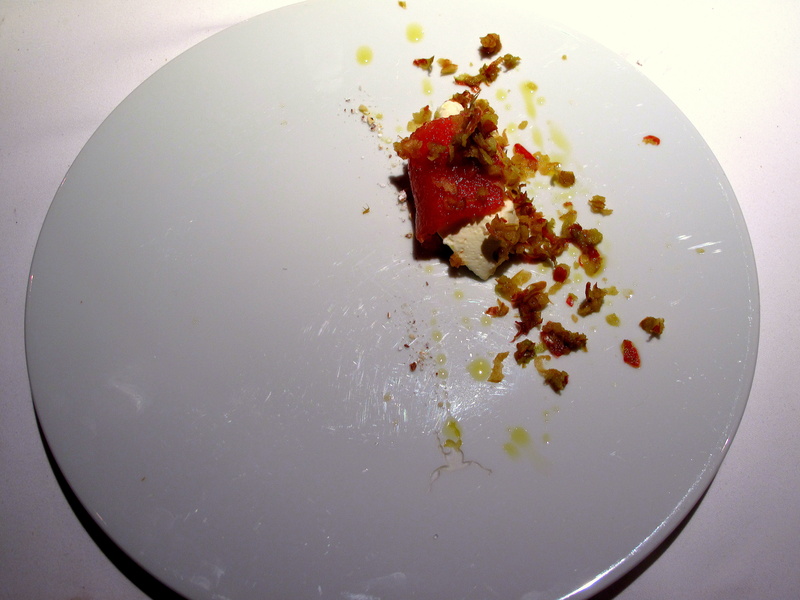 ‘I just want the relevant,’ the chefs declares and he cuts straight to the essential with dishes powerful, precise and to the point. It is a cuisine that dares. Alexandre Gauthier describes himself as testing the boundary between ‘pertinent et impertinent’. Walking such a tightrope however carries an inherent hazard – and this meal will bear testament to that fact. Sometimes dishes failed to come together, but these were minor and forgivable for when those risks did come off, the results were terrific. A mischievous talent and a cuisine différente…une cuisine délurée. the Tasse d’eau de mer and the lobster sound quite special – not sure how i feel about dousing honeycomb w/ lemon but i’ll have to try before judging. It’s nice to have you blogging again. @Michael Thanks…but technically, I had never stopped! 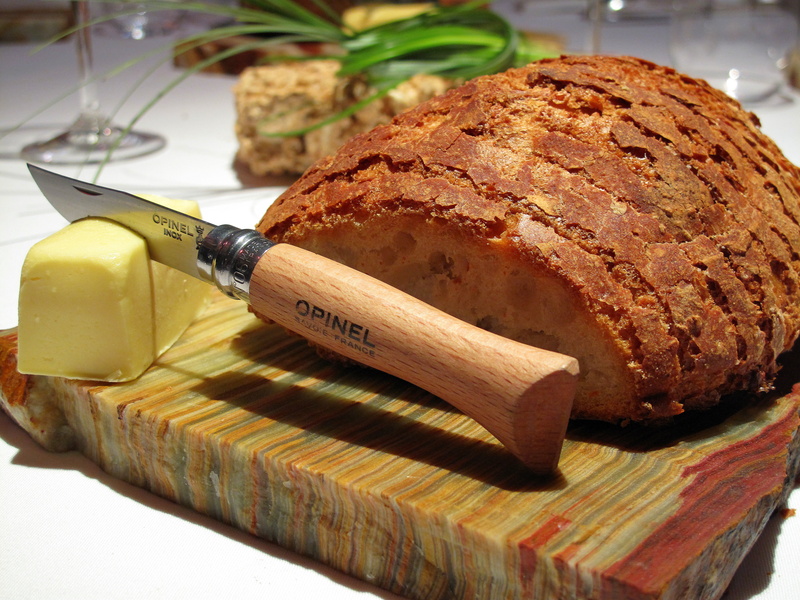 There is inedeed something homely about he place, especially considering a dish such as the gâteau de miel avec citron, no? it’s very interesting, two thumbs up! 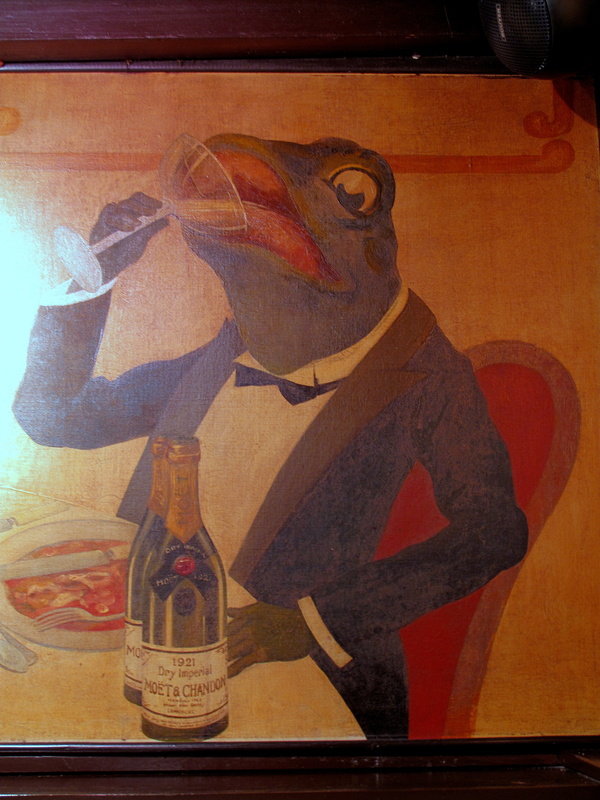 Our head waitress used to catch frogs near Lyon with her brother, chop off the heads and chuck them in a pan. The frogs still twitching after you cut th heads off. Sounds nice. Not sure we’ll be doing them in the restaurant..
See my current blog on http://fishfoodandlife.blogspot.com/ to see what we’re creating this week. simply adore your blog- are you not writing / updating anymore? 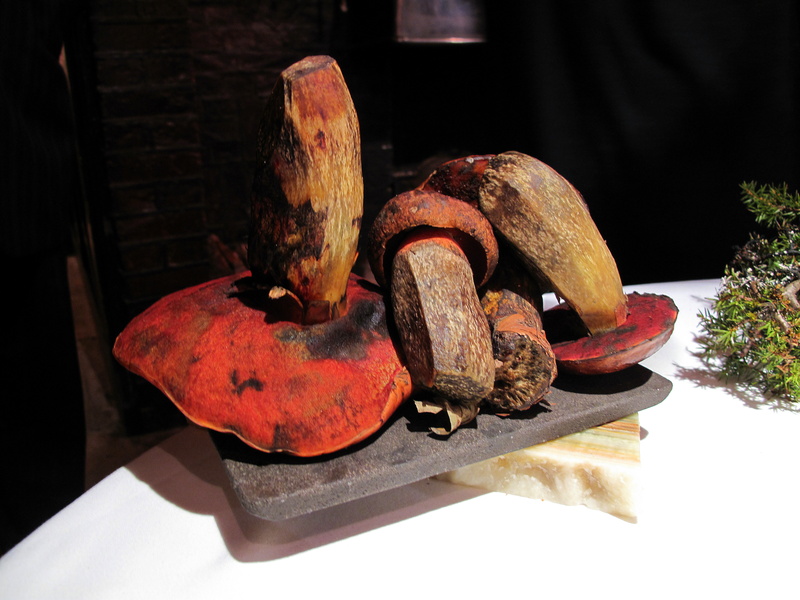 Its worth noting that ‘the fantastic fungi’ that turned blue sounds like a devils bolete – and almost all advice you read that any of the boletes that react in this manner shouldn’t be eaten – they may not kill you but are certainly toxic and likely to bring on severe food poisoning symptoms. 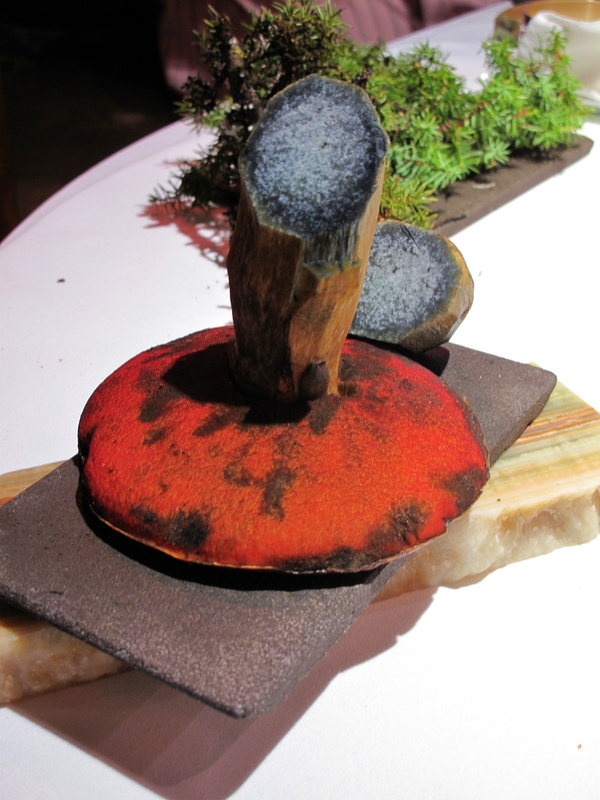 Whilst I’m not criticising the theatre of presenting fungi in this way its slightly worrying firstly, to have toxic mushrooms knocking round a professional restaurant and secondly by implication that they were then served in the dish that followed. So just a health warning to anyone seeking to replicate the above. 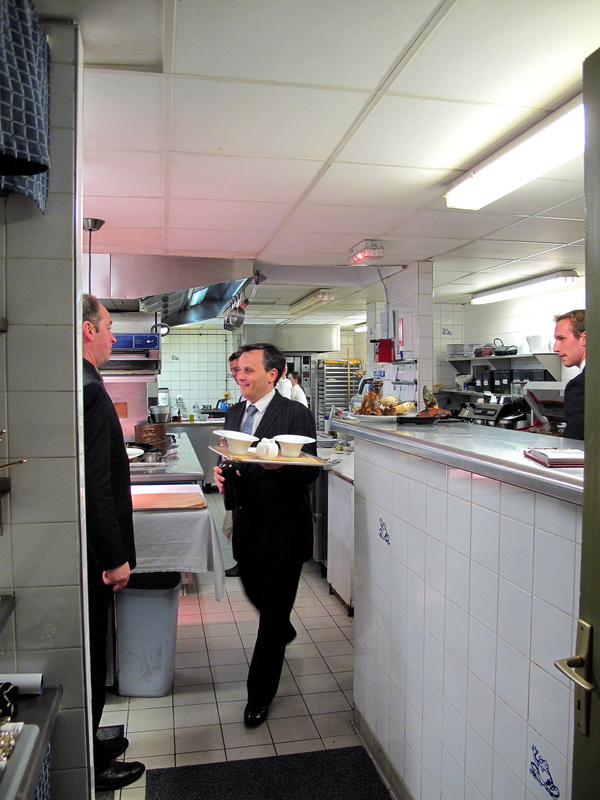 A brilliant chef, briliant modern French cuisine! Alexandre, and his maitre d’ hotel, Pascal, will be visiting Stratford, Ontario, Canada, to teach and cook at the Stratford Chefs School, from January 24th thru January 28th, 2011.